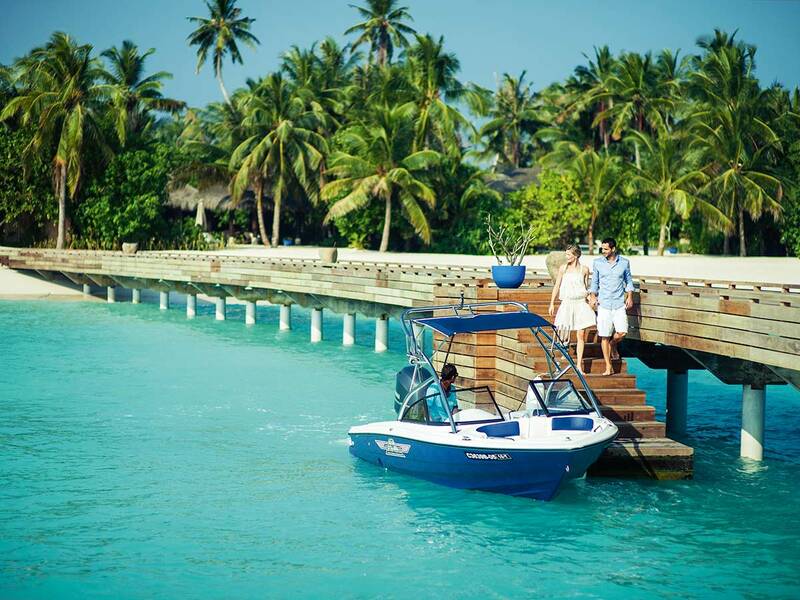 A scenic seaplane photo-flight of 45 minutes from Male' International Airport takes you to Velaa Priate Island. 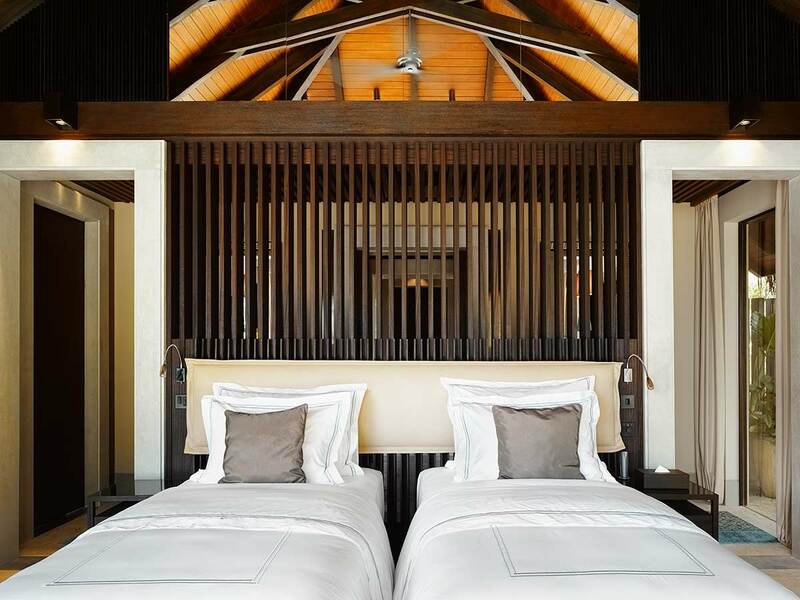 Set in the largely undiscovered part of the Noonu Atoll, Velaa Private Island is a fusion of elegance and contemporary luxury. 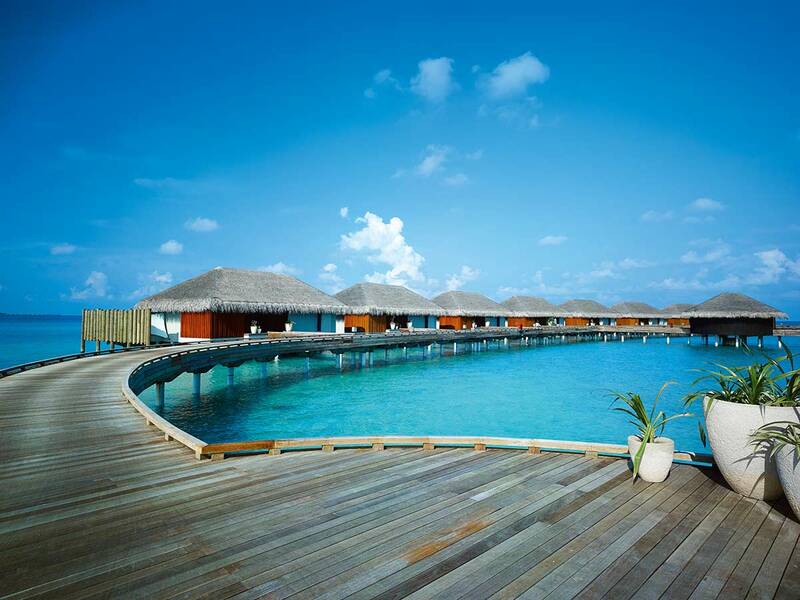 It inherited its name from the original island name Fushi Velavaru which literally means “turtle island”. 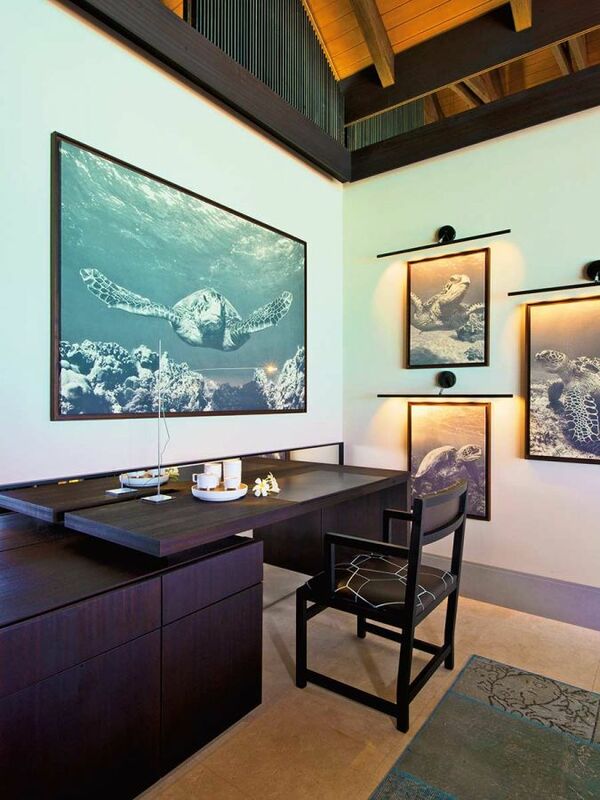 Sea turtles flock to this island in the breeding season. 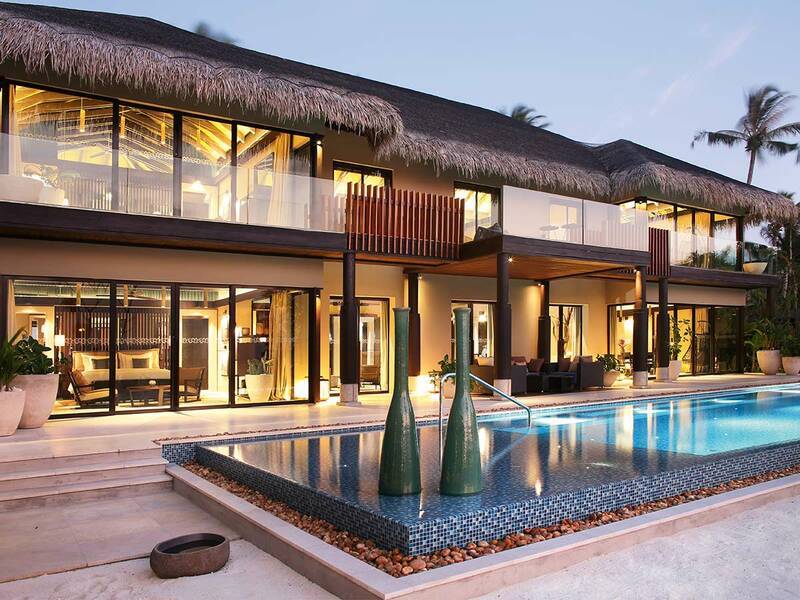 It was their home for countless years. 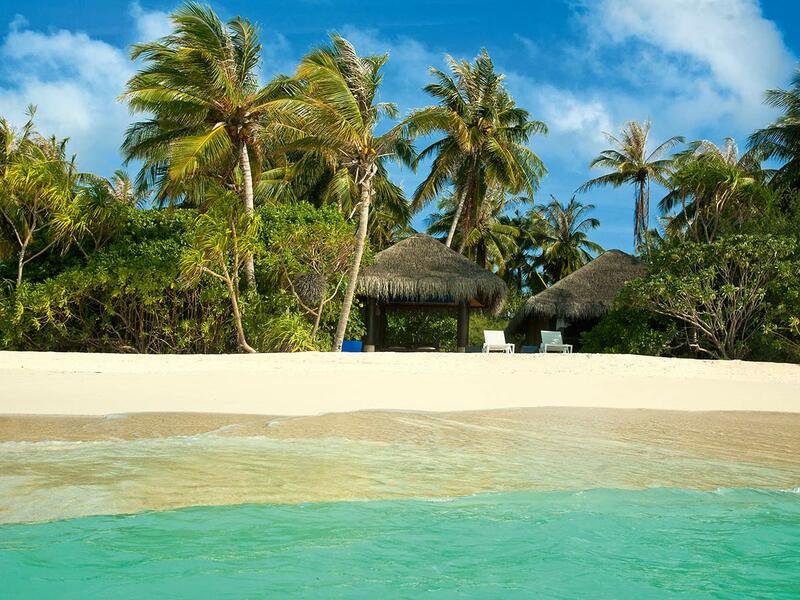 Thanks to Jiri Smejc, the owner of the resort, for leaving some space between the villas so that these amazing creatures can still enjoy their island. 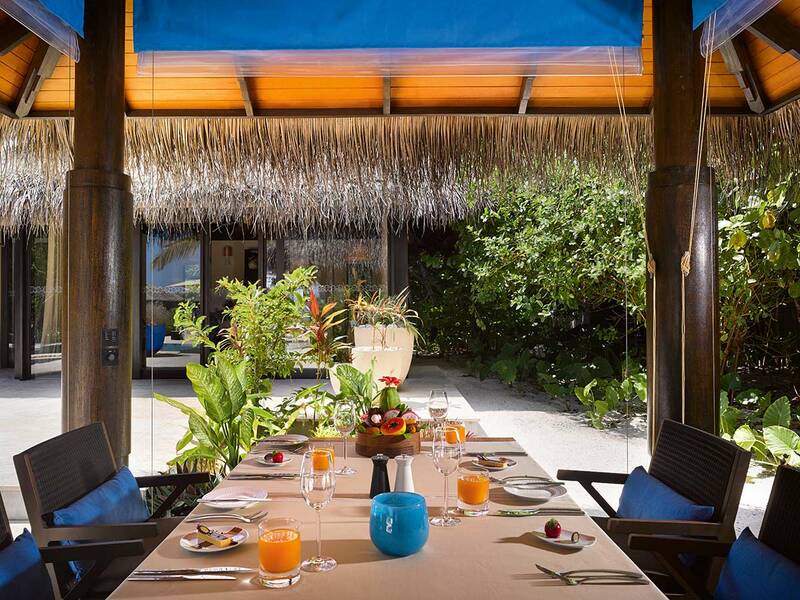 The beachfront house nestled in tropical vegetation with swaying palm trees is ideal for couples and small families. 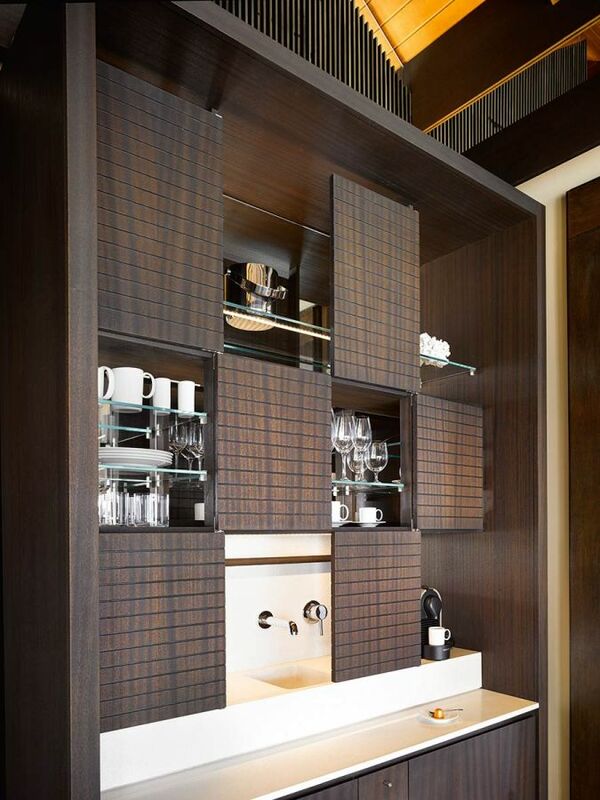 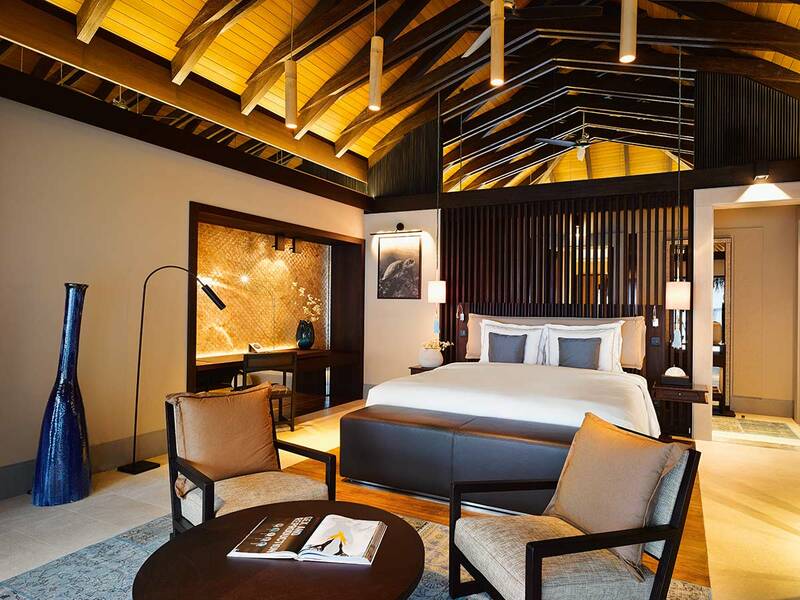 The pavilion comes with an additional space convertible to a second bedroom, spa, gym or library as you prefer. 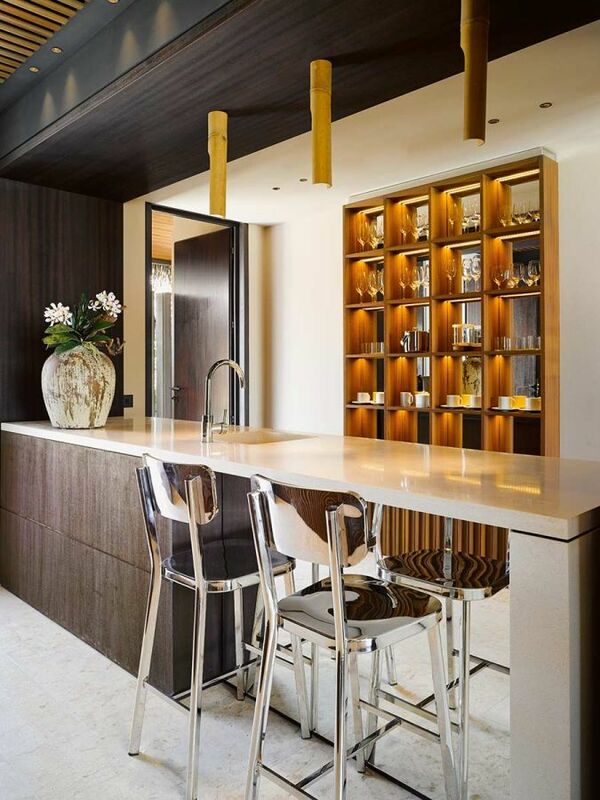 There is a large living area and a kitchen with high stools to serve as both a bar and facilitate catering. 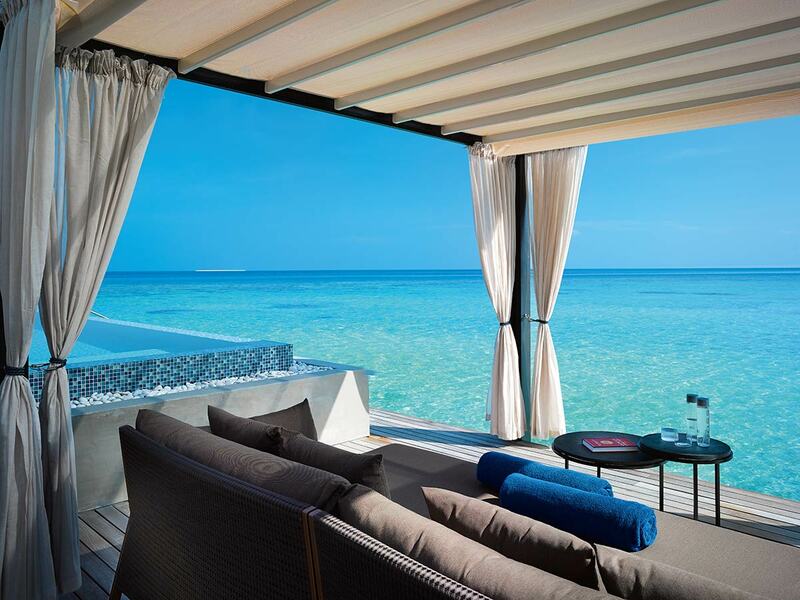 When you step out from your bedroom its a large terrace with private pool, carefully positioned day beds and a dining platform that gives panoramic view of the lagoon faded into the blue ocean. 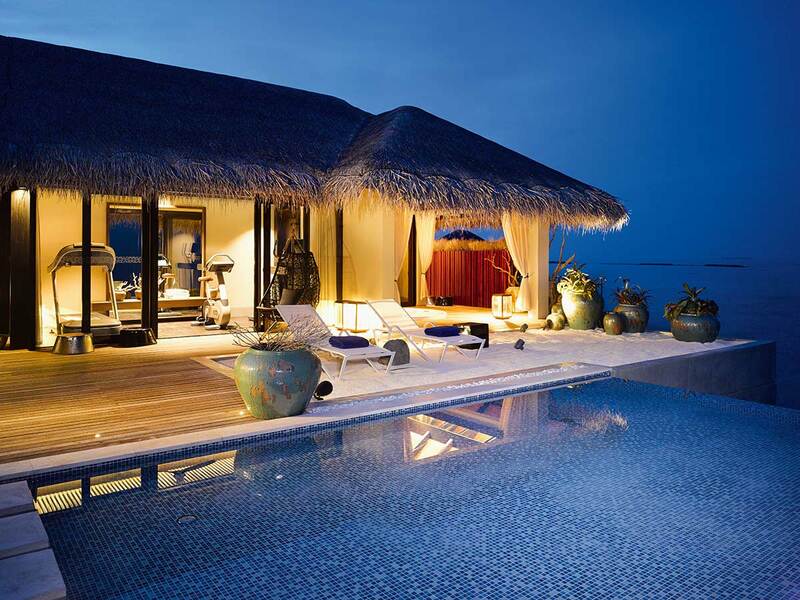 Total Area: 581 square meters of which 189 are interior and 337 exterior, pool 74 square meters. 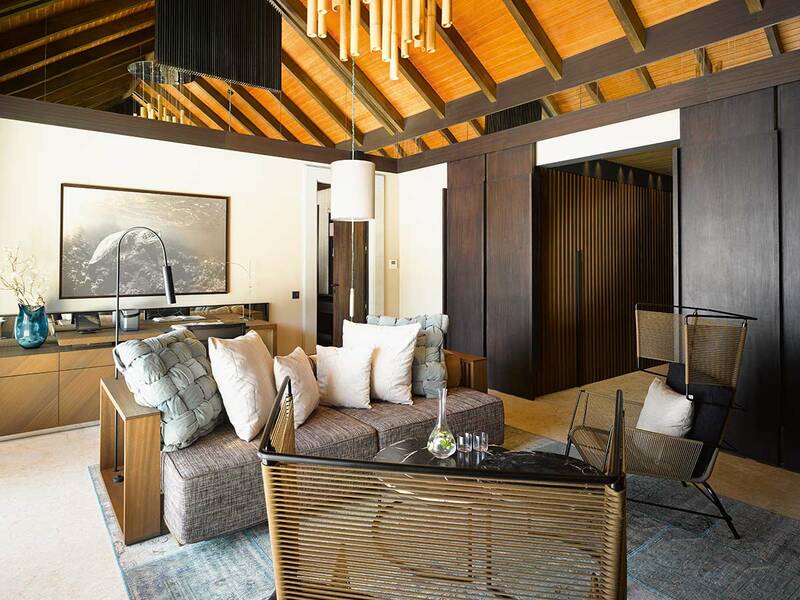 In two bedroom customization the rooms are separated by a spacious living area which is designed to work as a retreat in the day and social hub at night. 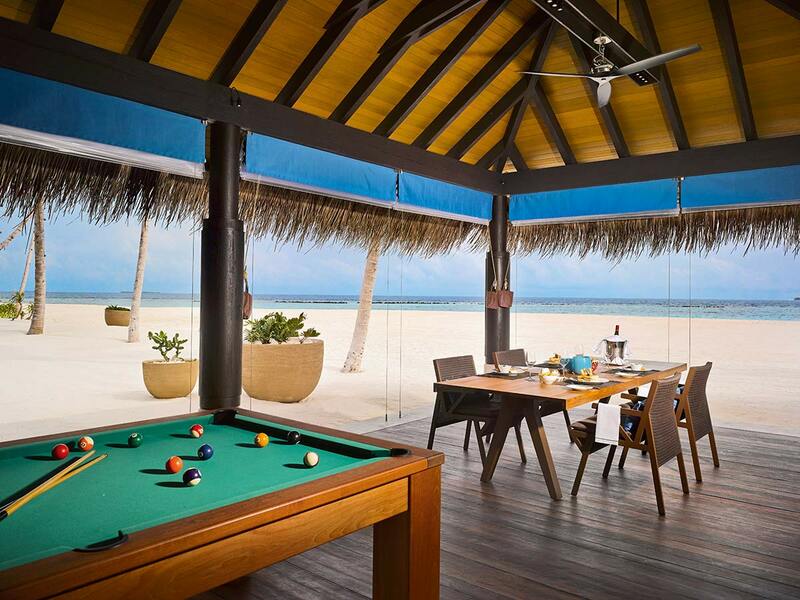 Beach Pool House comes with a kitchen that looks like a bar with high stools but also facilitates catering. 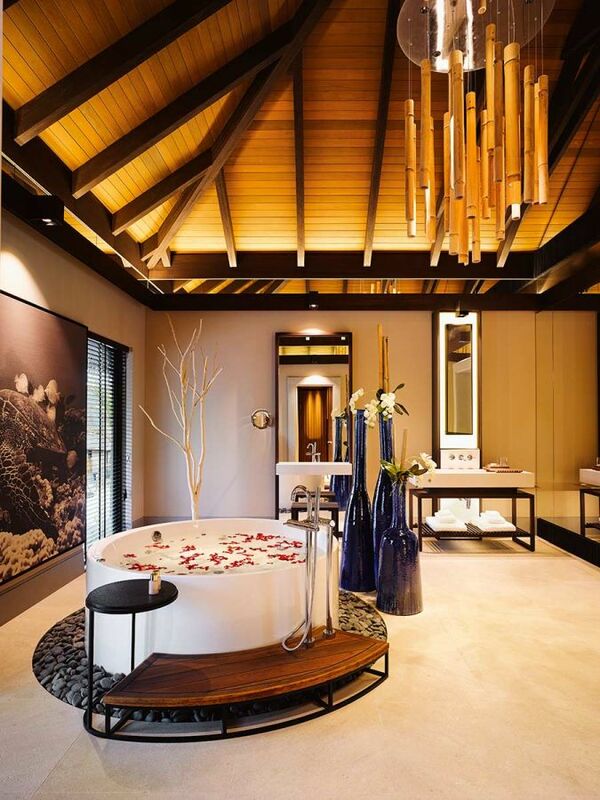 Lighting and decor are perfected to reflect harmony and feel of relaxation. 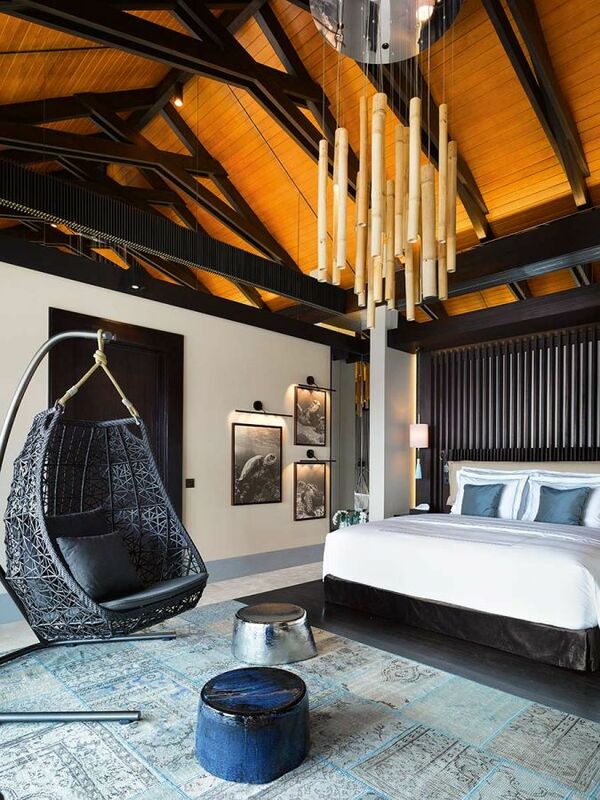 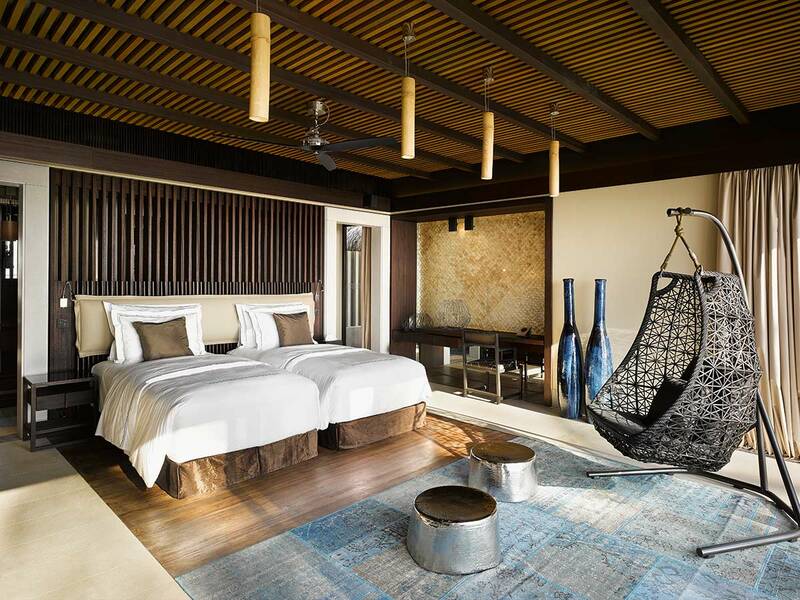 Rattan swing chairs in the bedroom could be fun, especially for families. 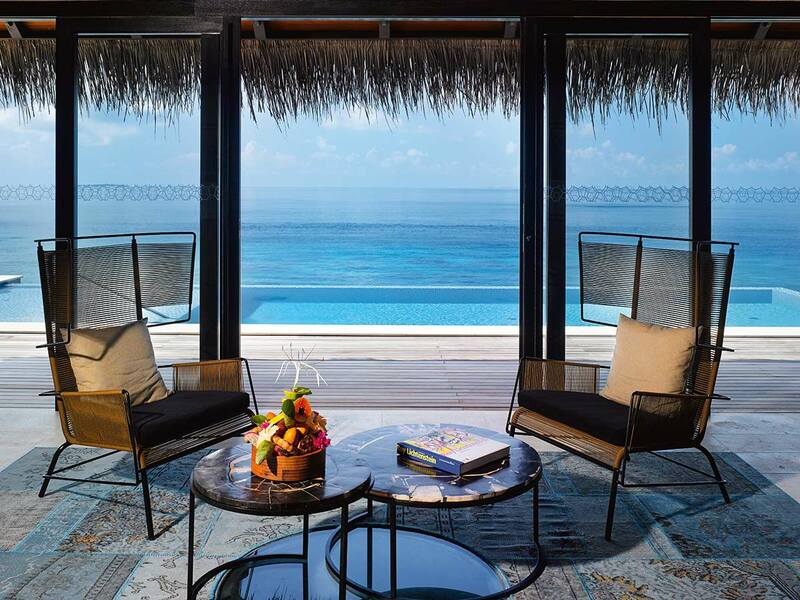 When you step out the terrace is a hallmark of pleasing atmosphere with private pool, carefully positioned day beds and private dining platform which overlooks the beach and lagoon. 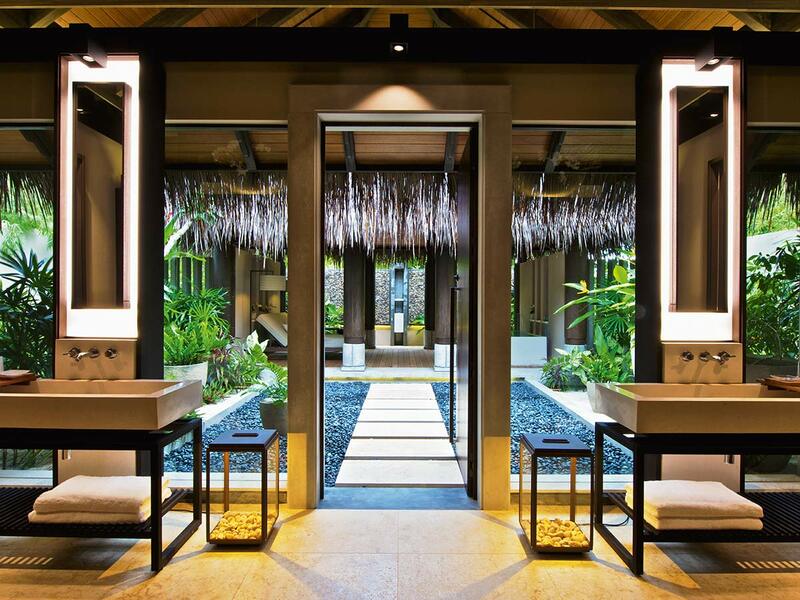 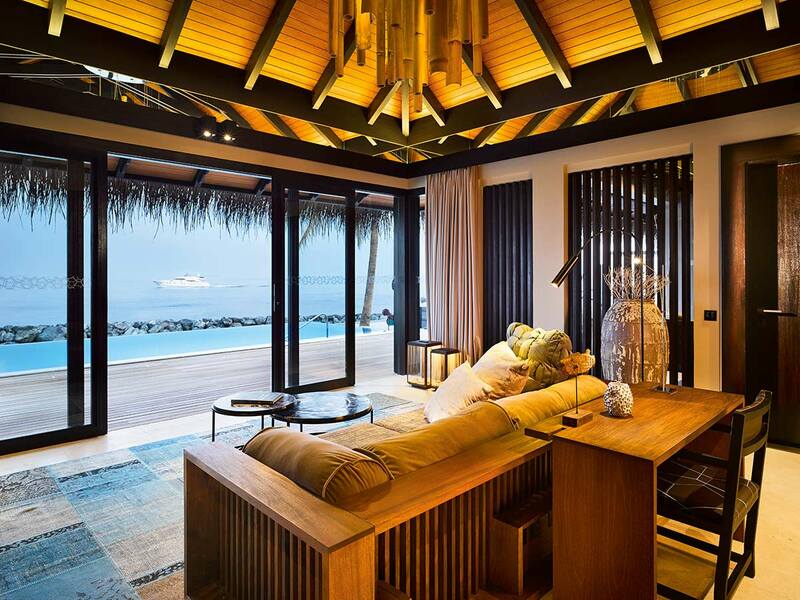 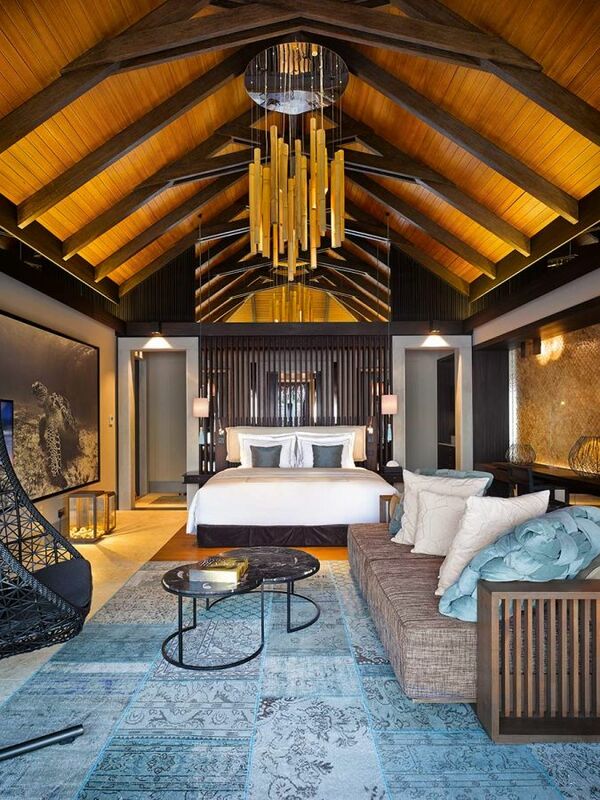 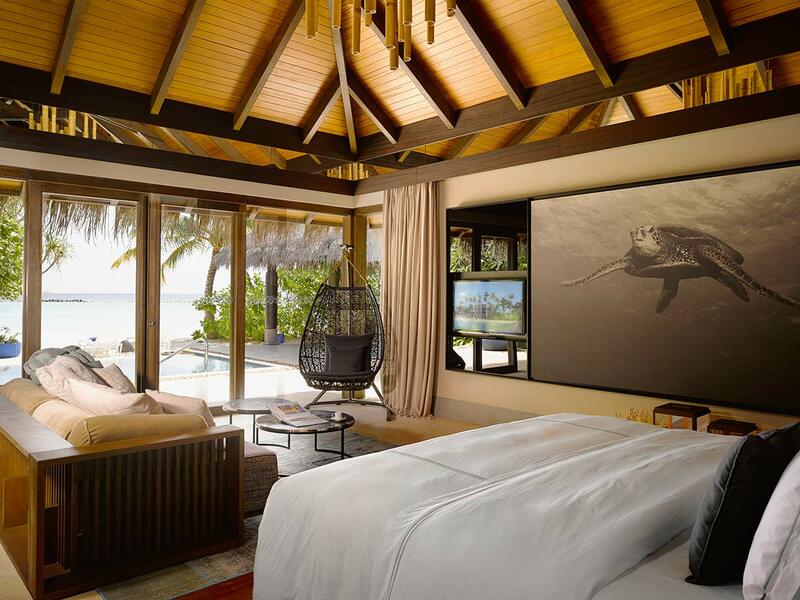 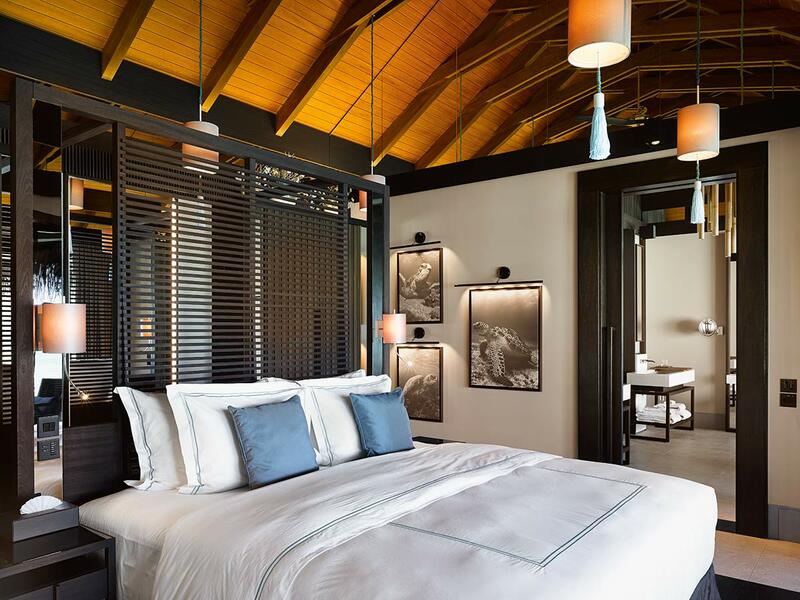 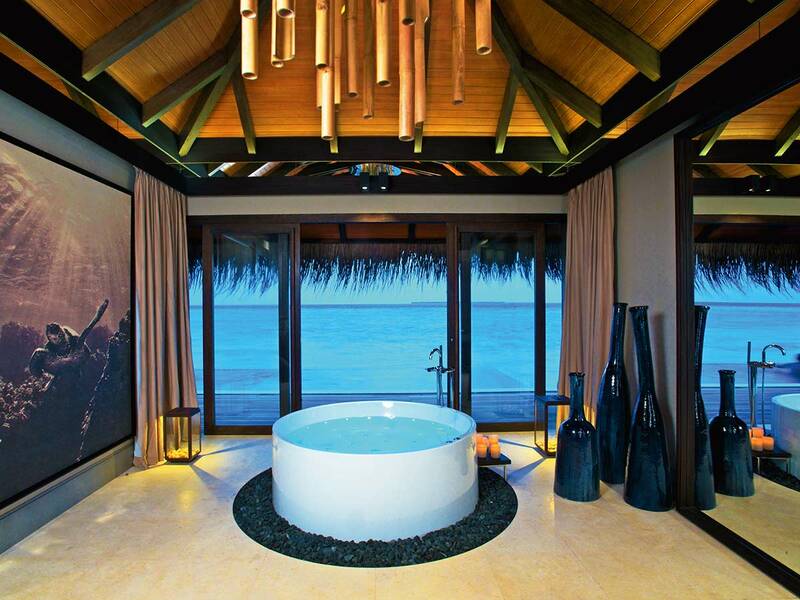 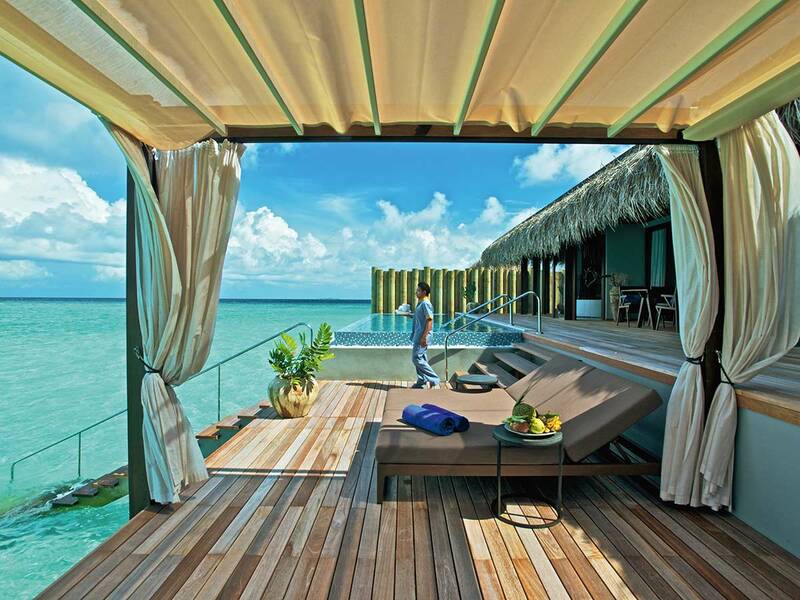 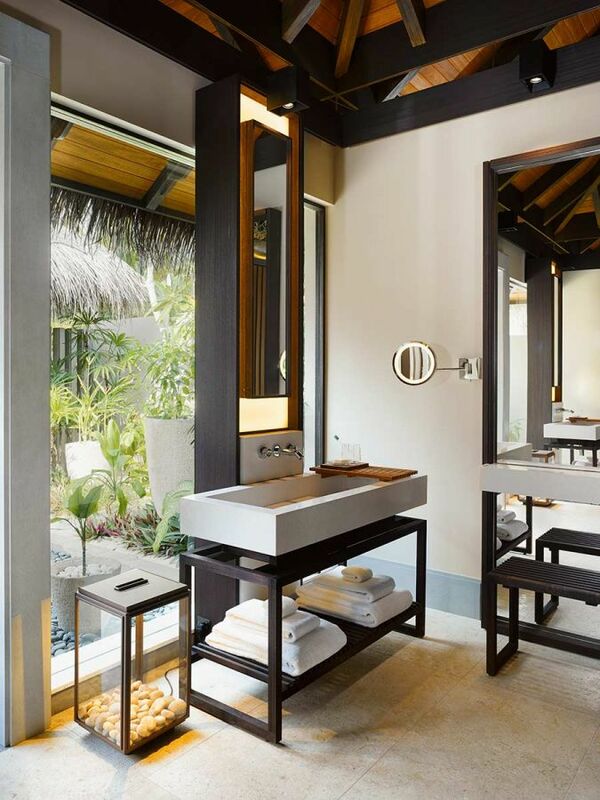 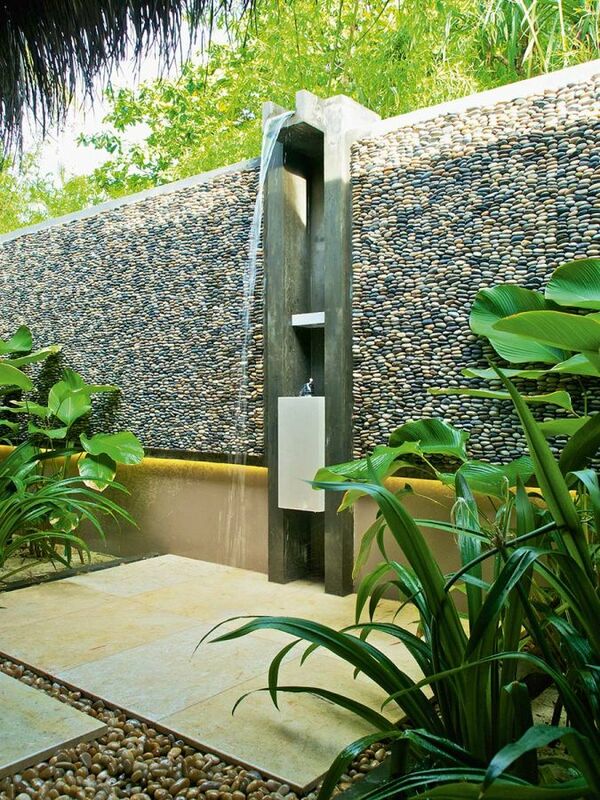 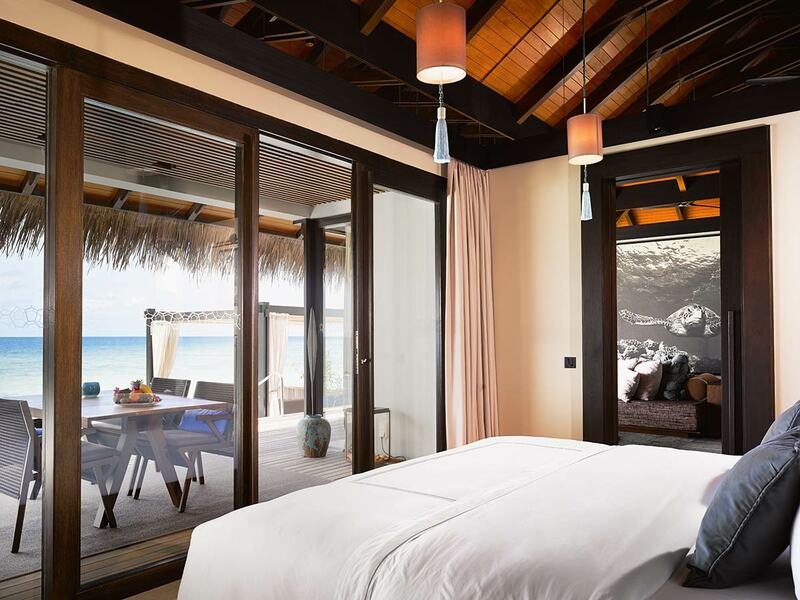 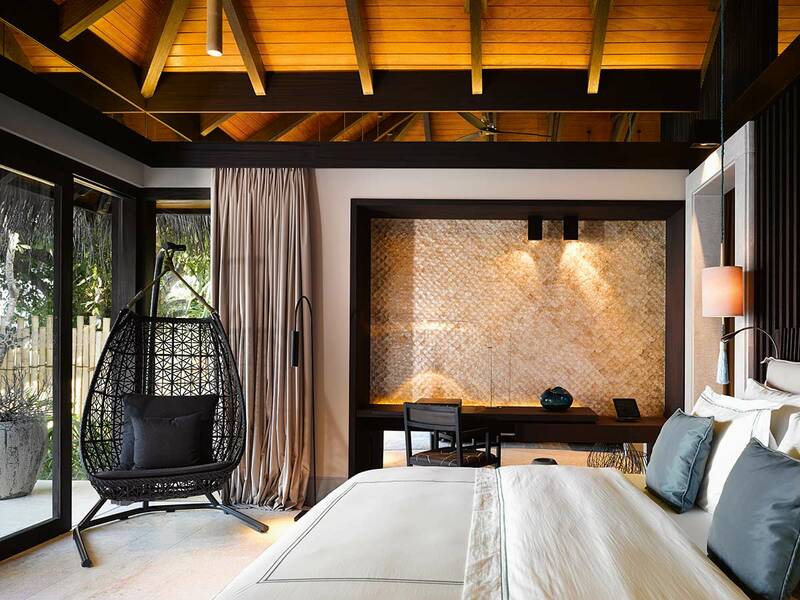 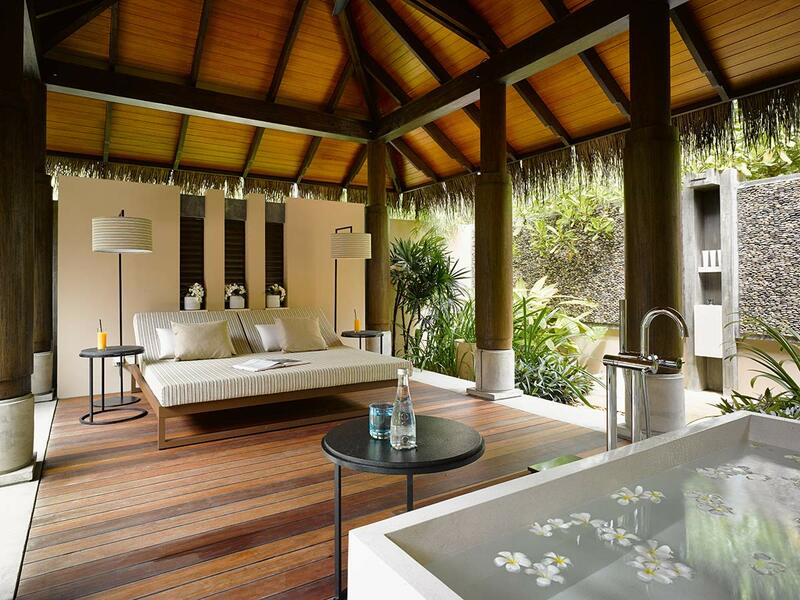 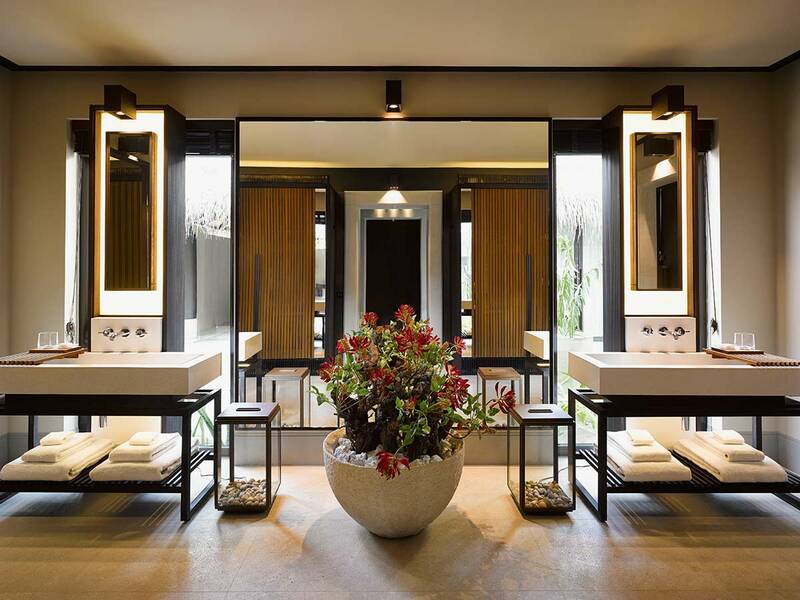 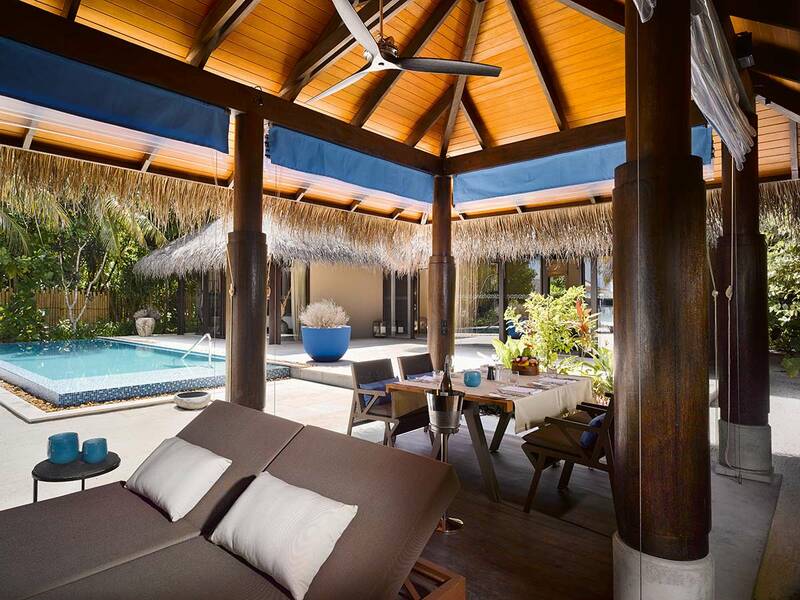 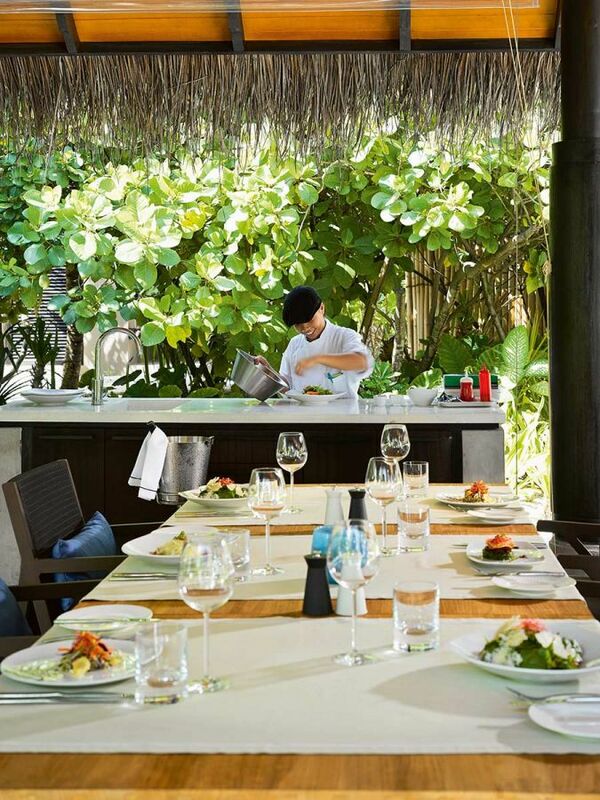 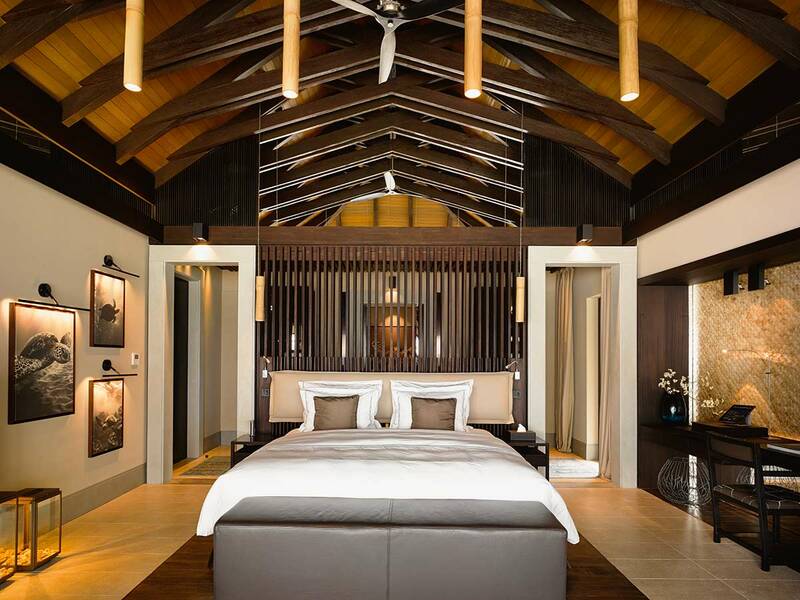 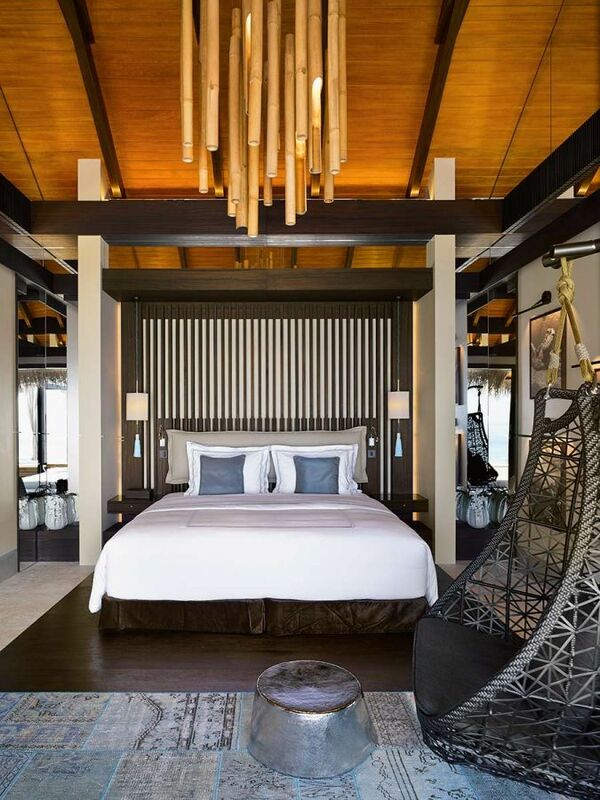 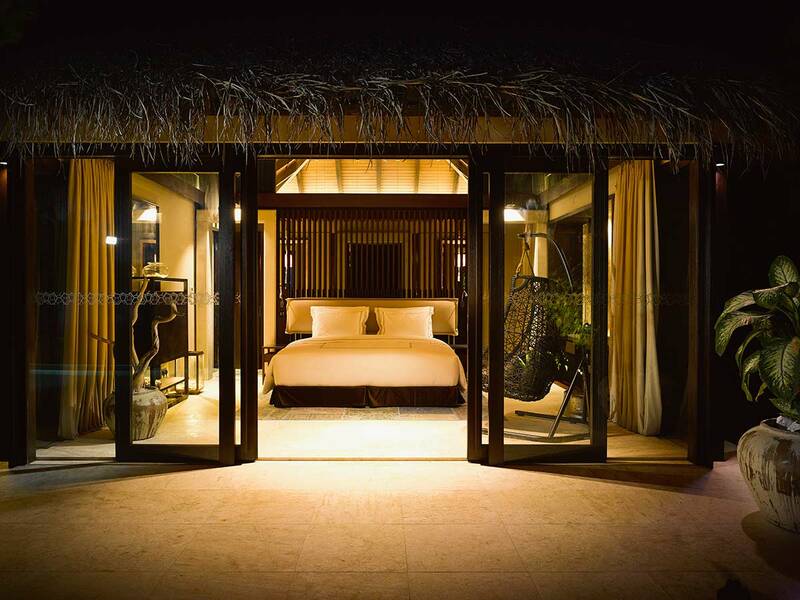 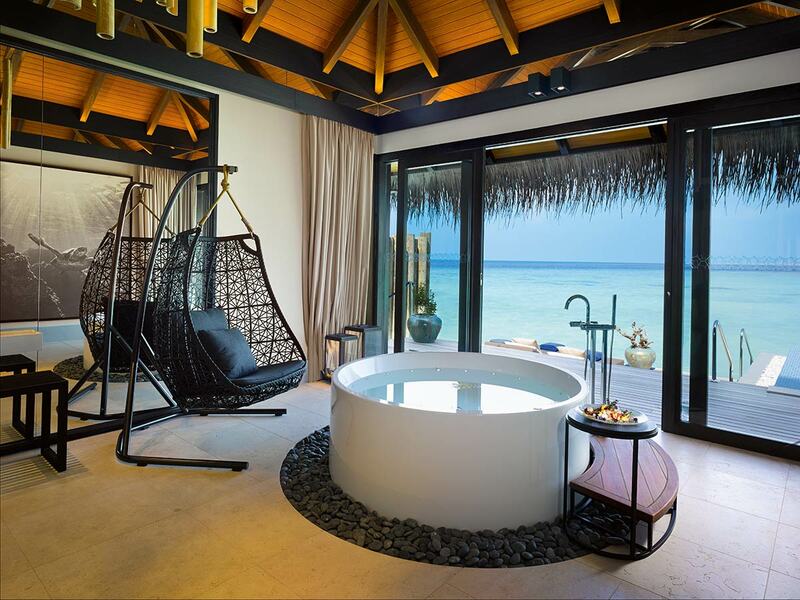 Selectively furnished beachfront pool villa is an affair of luxury and sense of nature. 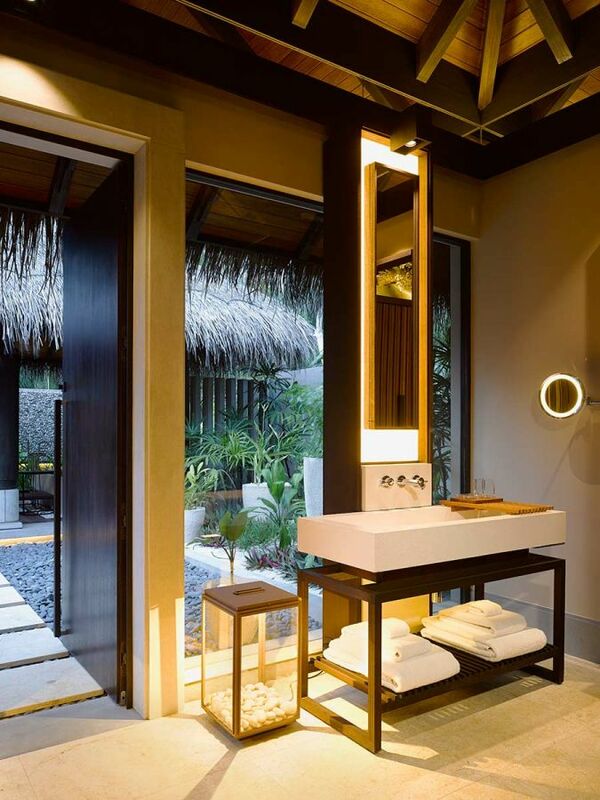 Reflective lighting bring perfections to this architectural wonder, as if the sense of relaxation never wants to leave you. 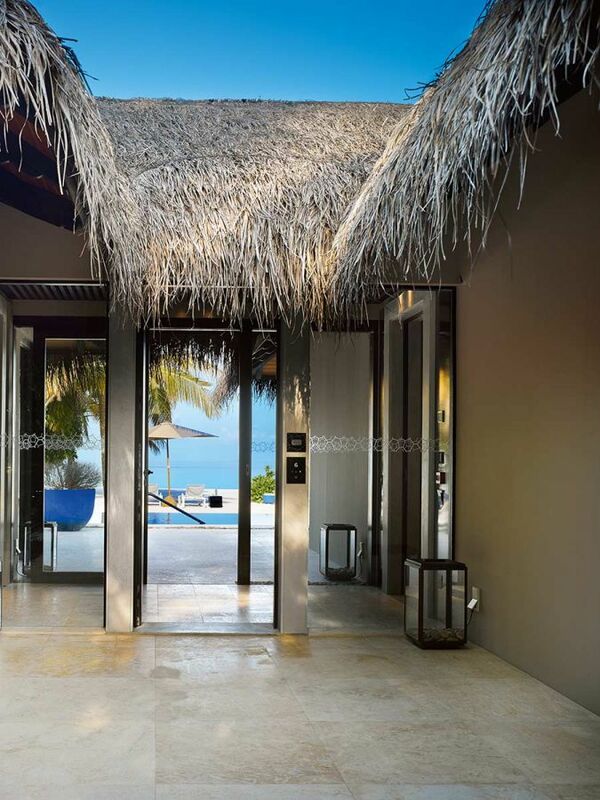 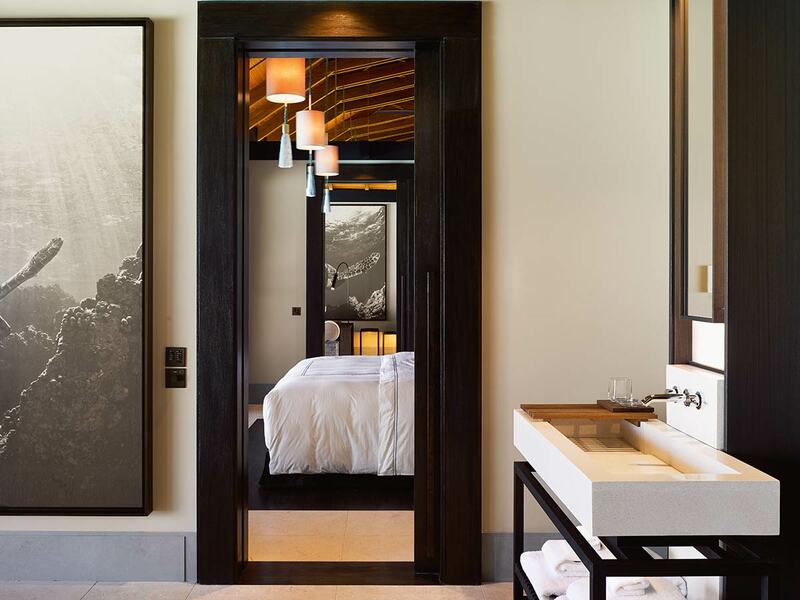 Complete wall-to-wall glass doors gives you a magnificent view of lagoon over the private pool. 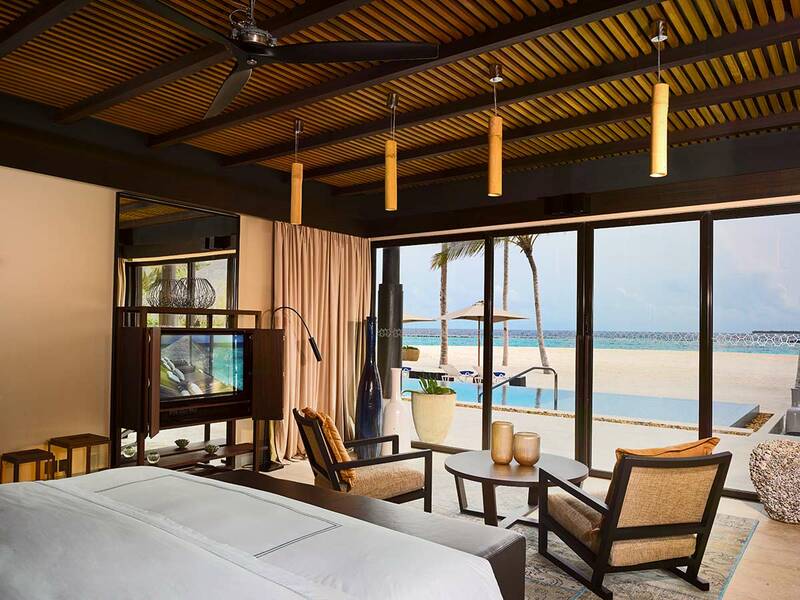 The terrace and day bed is a pleasing environment that embraces a full view of the beach and lagoon. 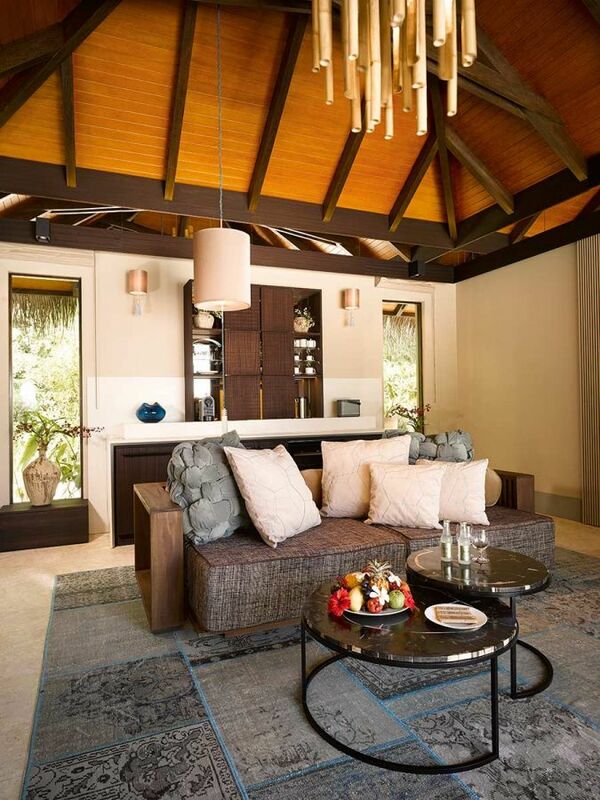 Villa's dining area located here is an additional enhancement. 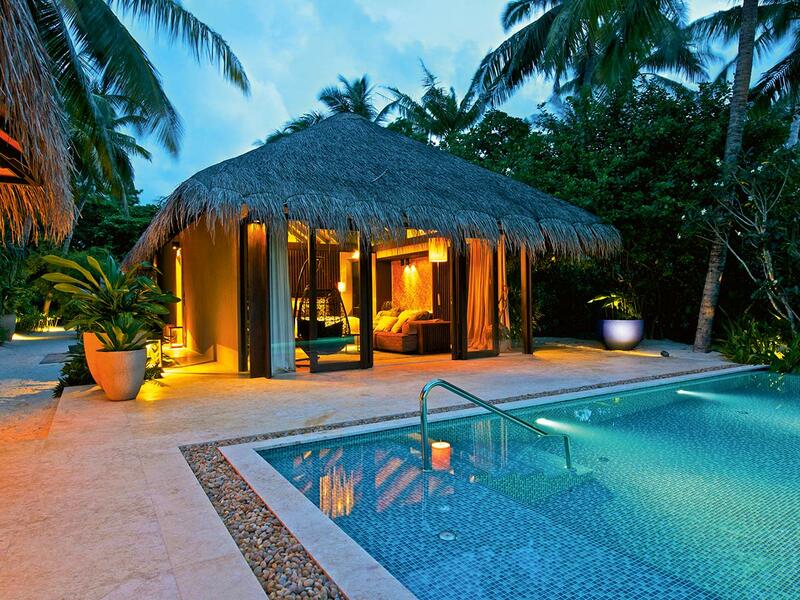 Its a total of 295 square meters, 80 in interior, 179 in exterior and 36 square meters for pool. 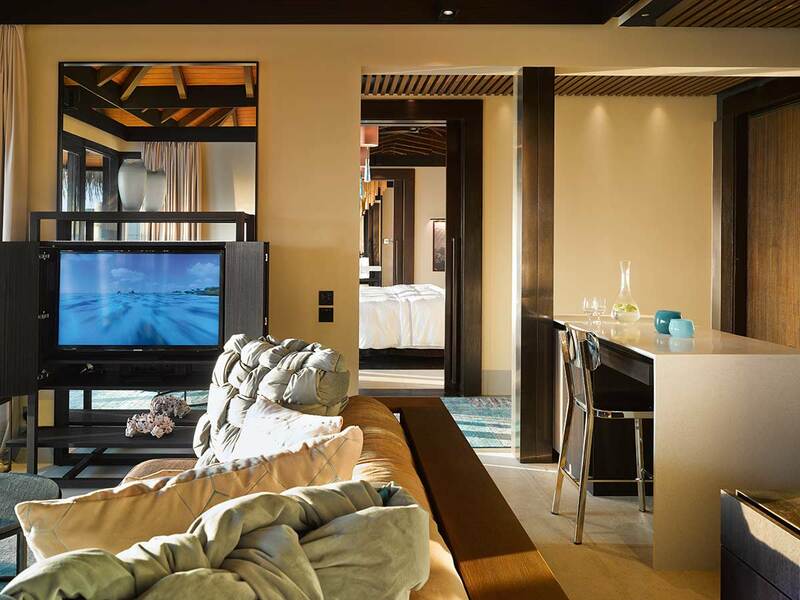 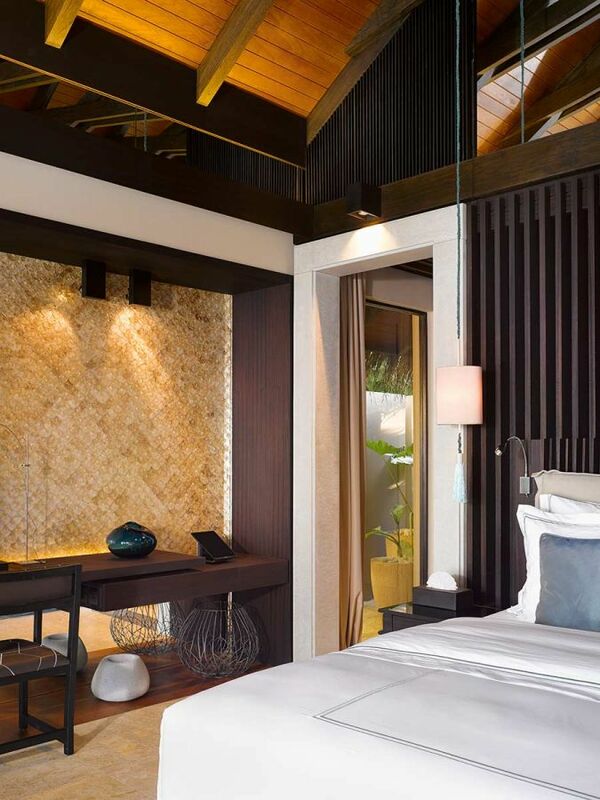 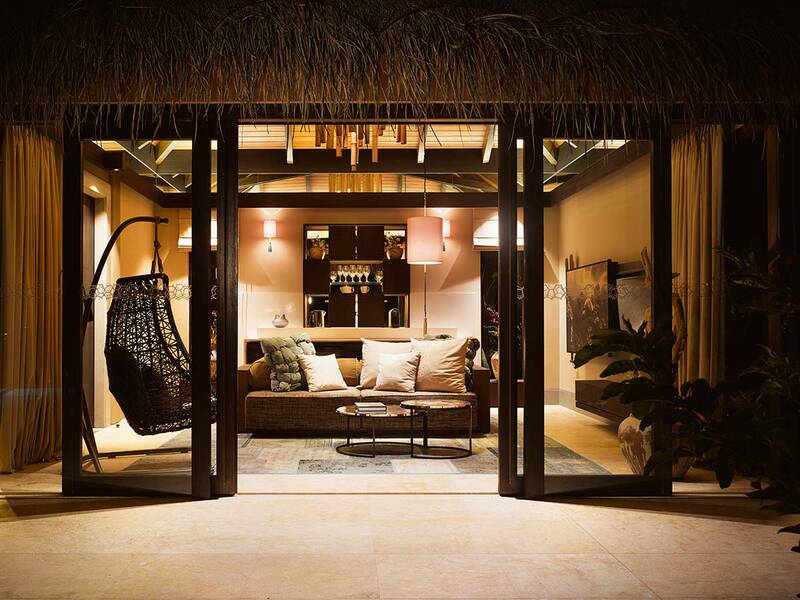 Deluxe Beach Pool Villas are more spacious and come with an additional living area. 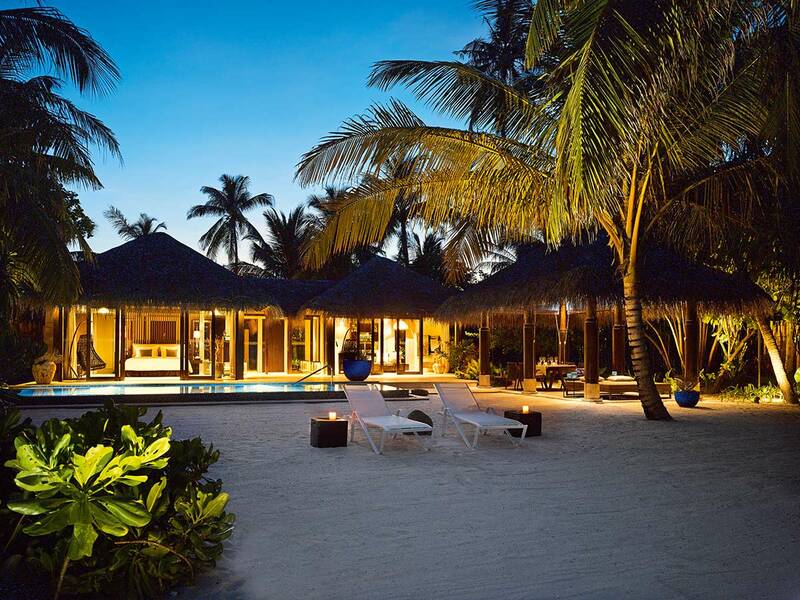 Its deal for couples who dream spacious beachfront living. 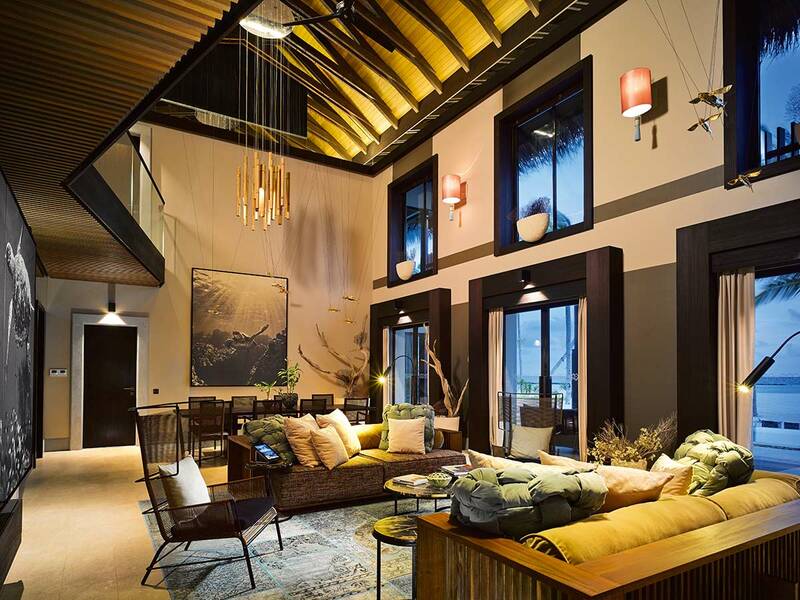 Total area extends to 346 square meters that is divided into 108 in exterior, 188 in exterior and 50 square meters for private pool. 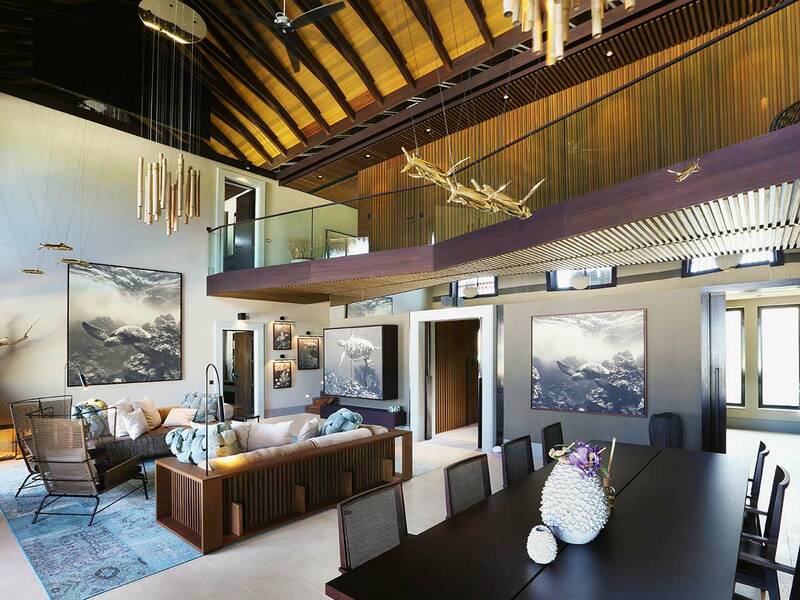 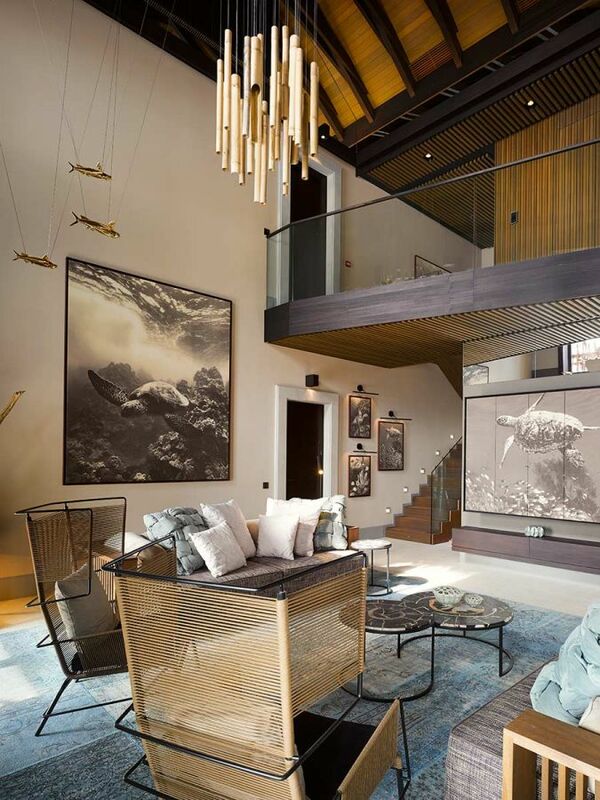 Generous two bedroom house over the water offers elegant living blended with art and harmony. 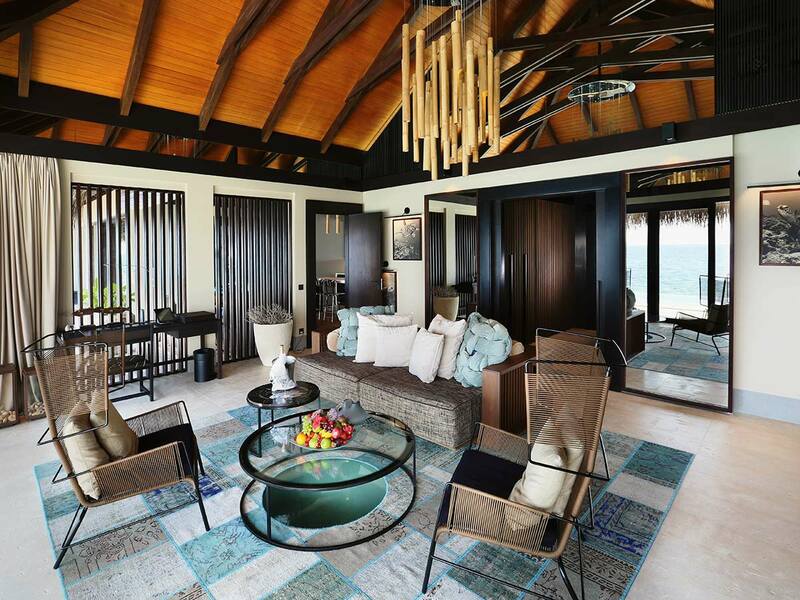 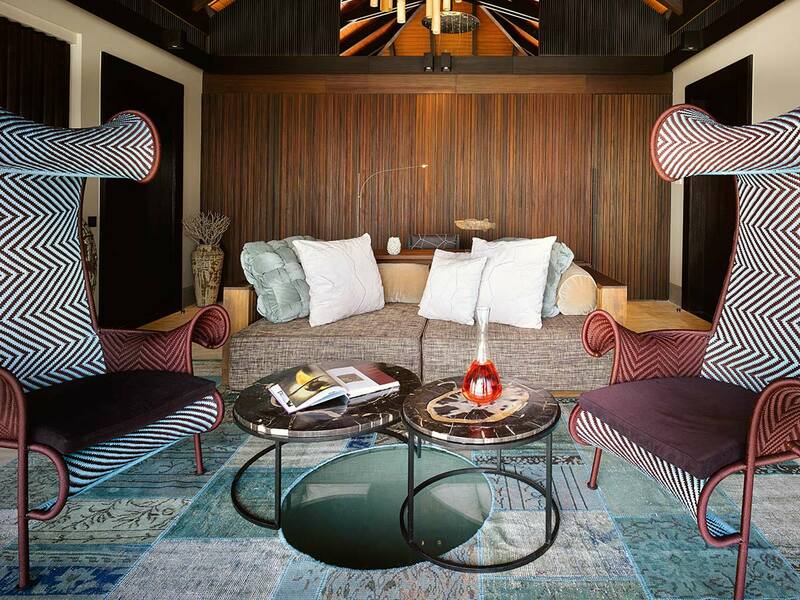 Catch fresh breeze flowing over the India Ocean at the comfort of unusual but comfy furnishing. 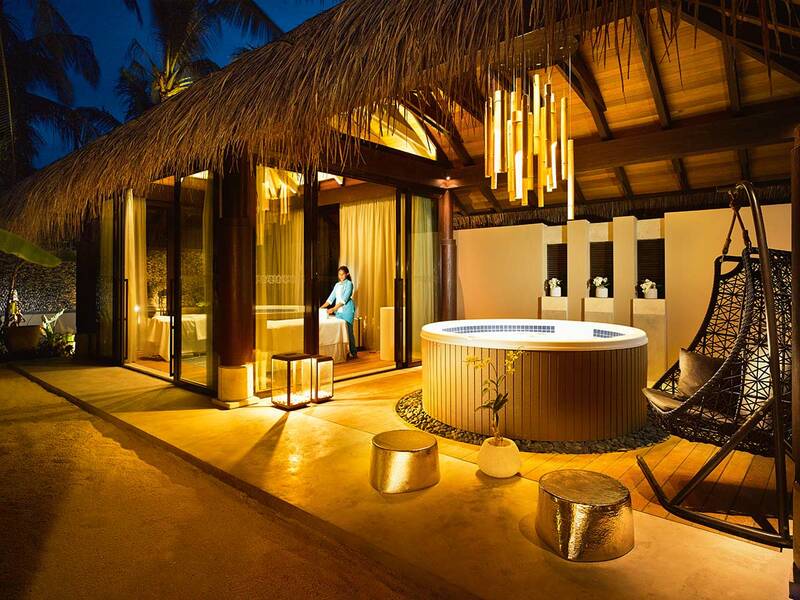 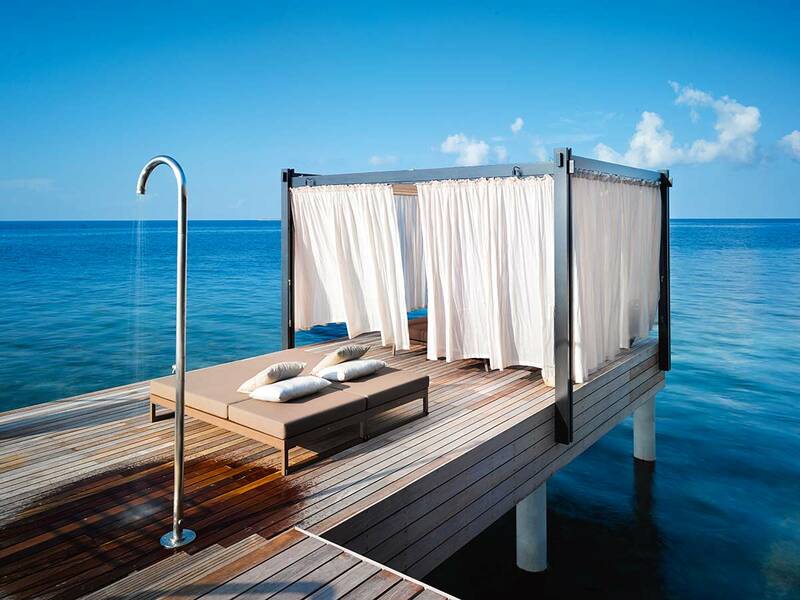 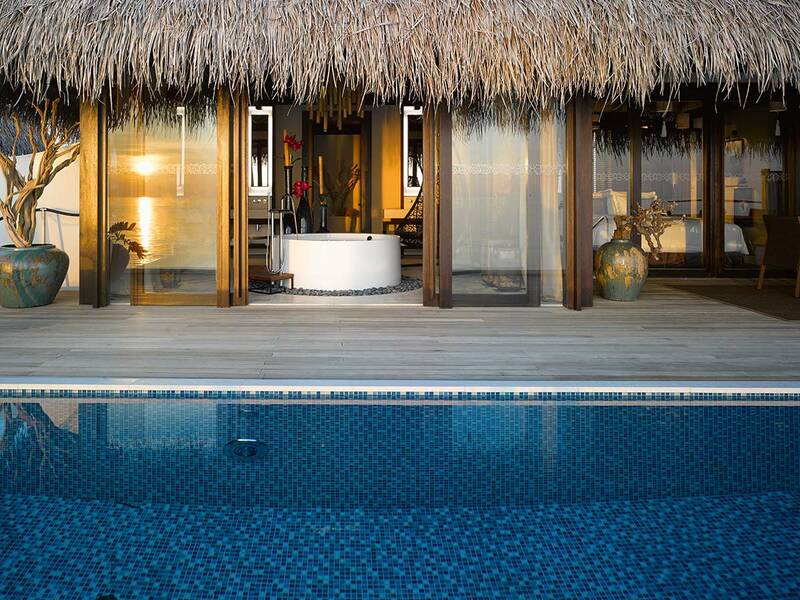 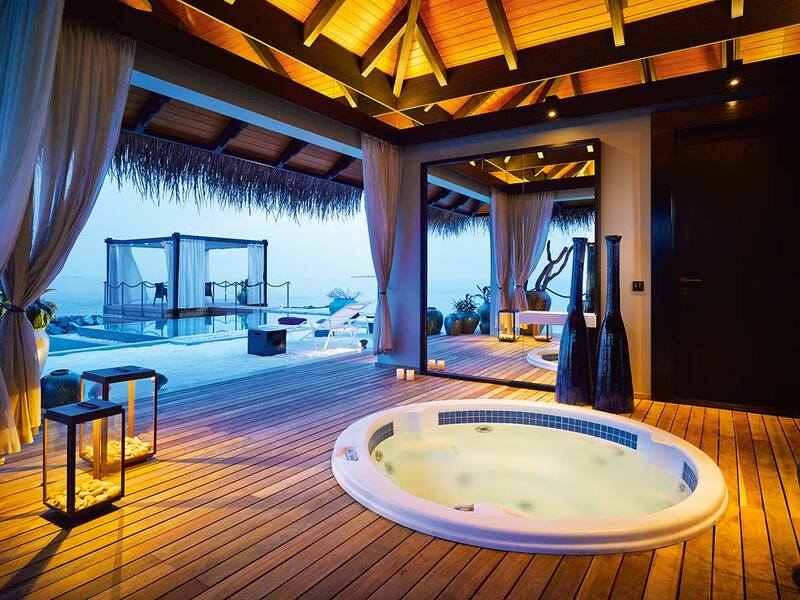 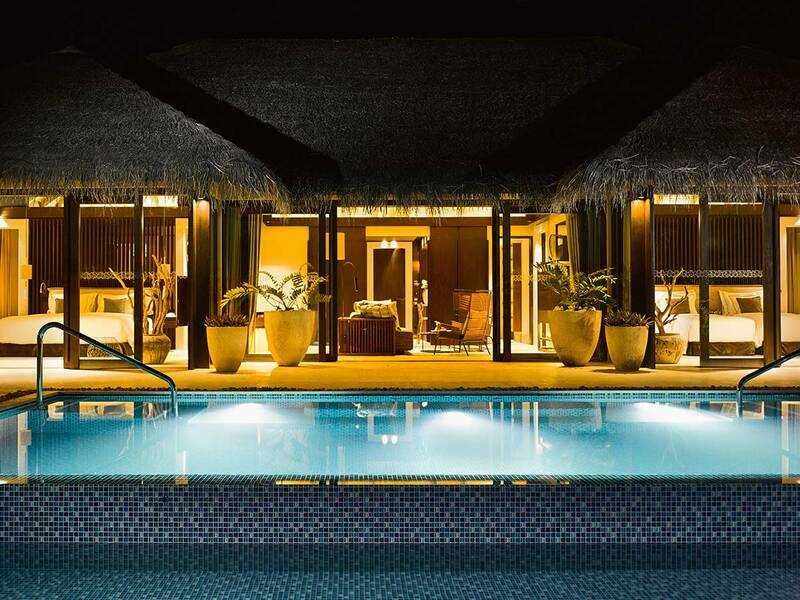 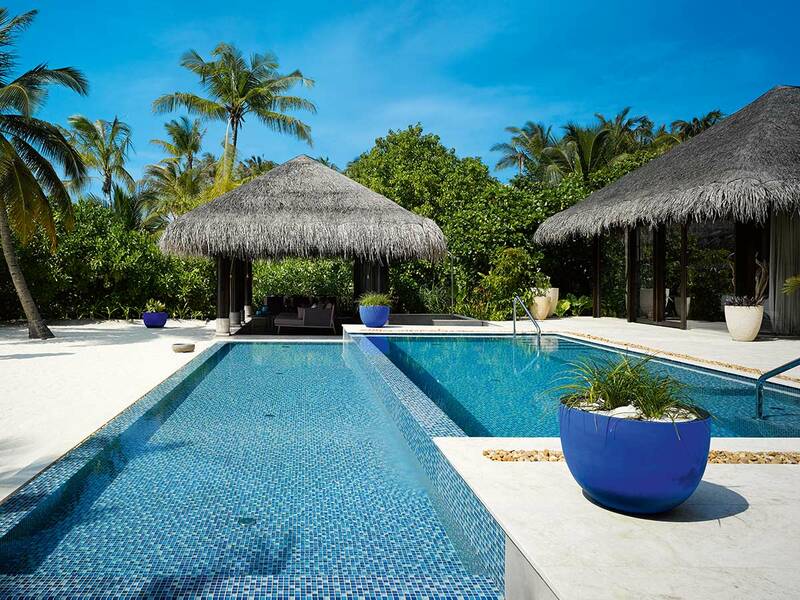 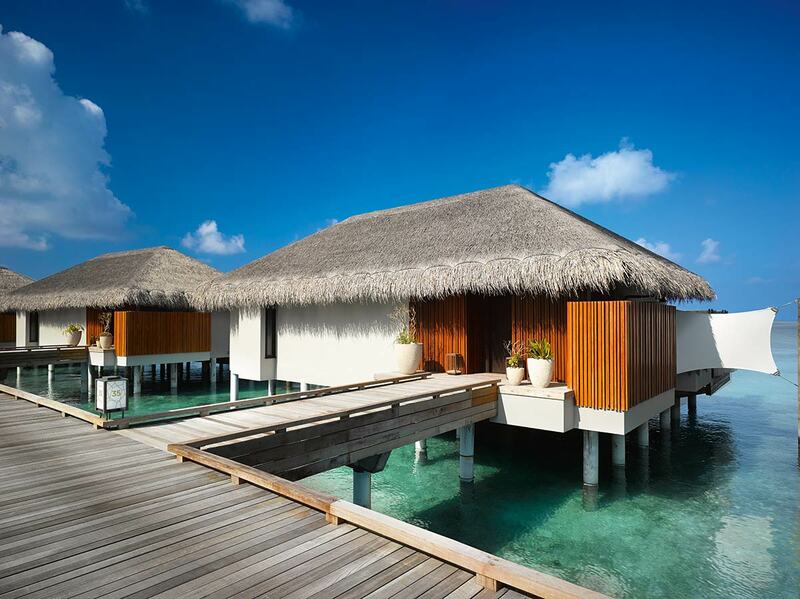 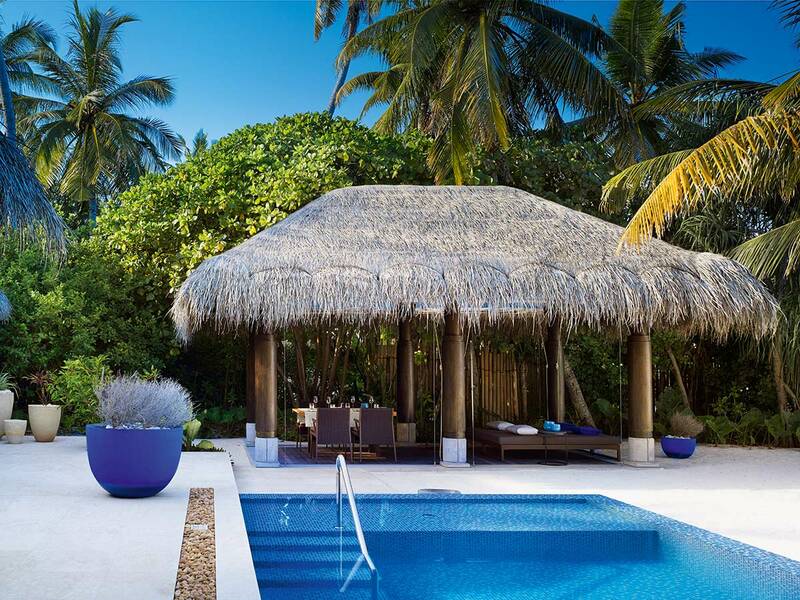 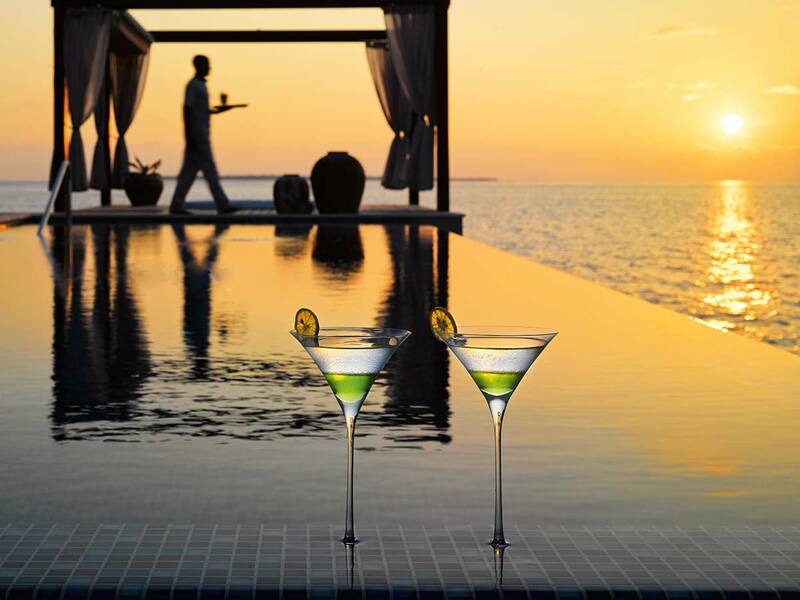 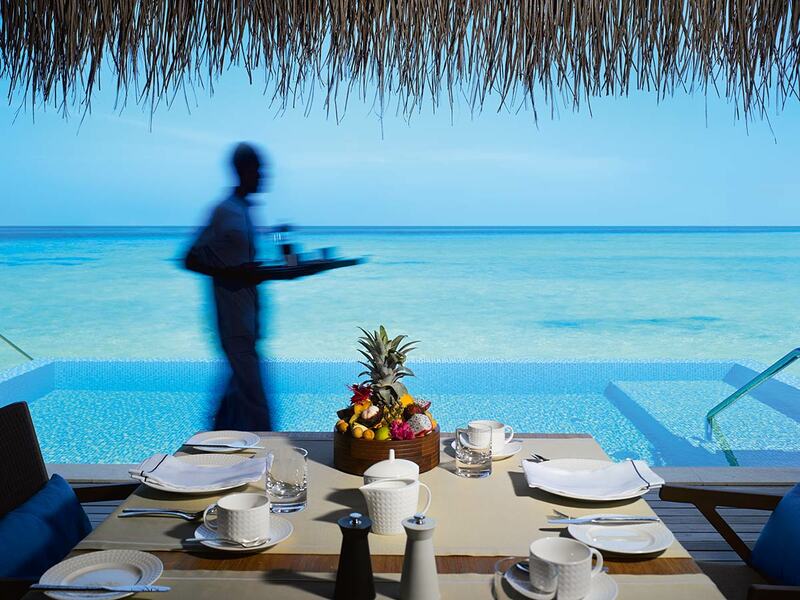 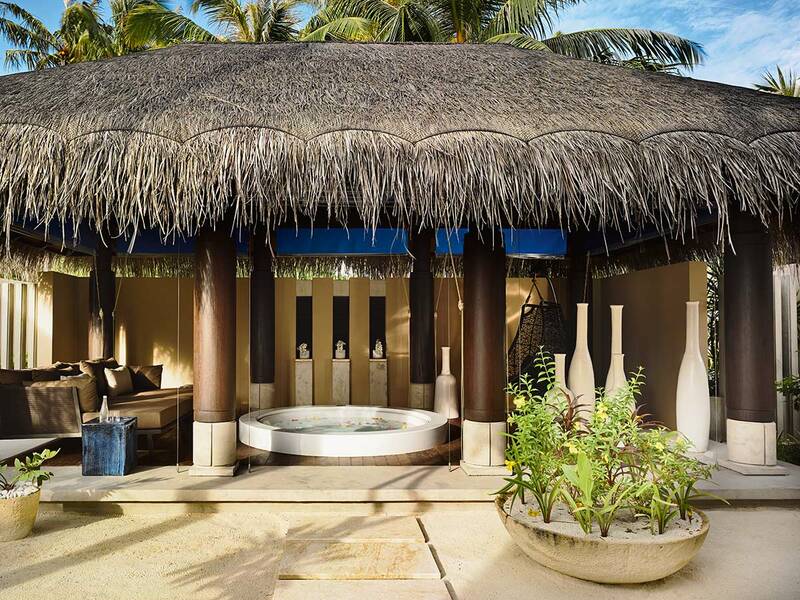 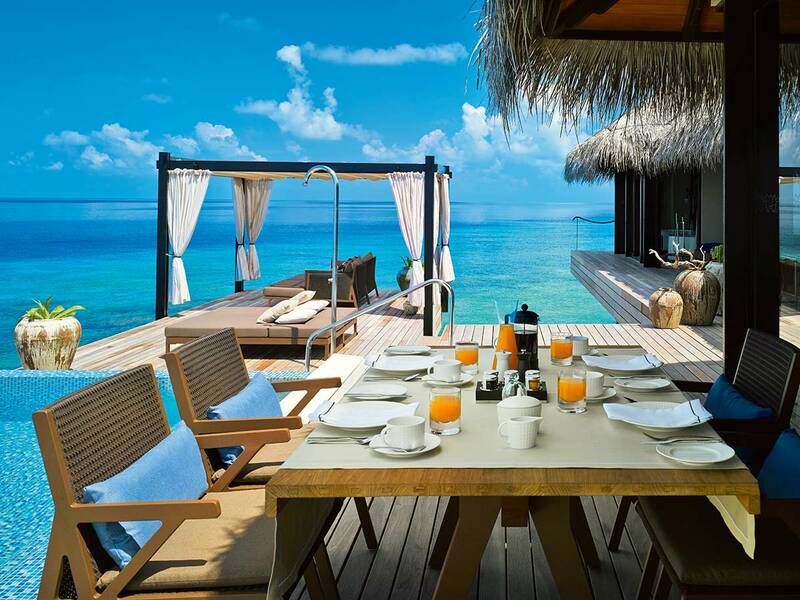 Perfectly-sized terrace holds a pool to enjoy with utmost privacy in the most private resort in Maldives. 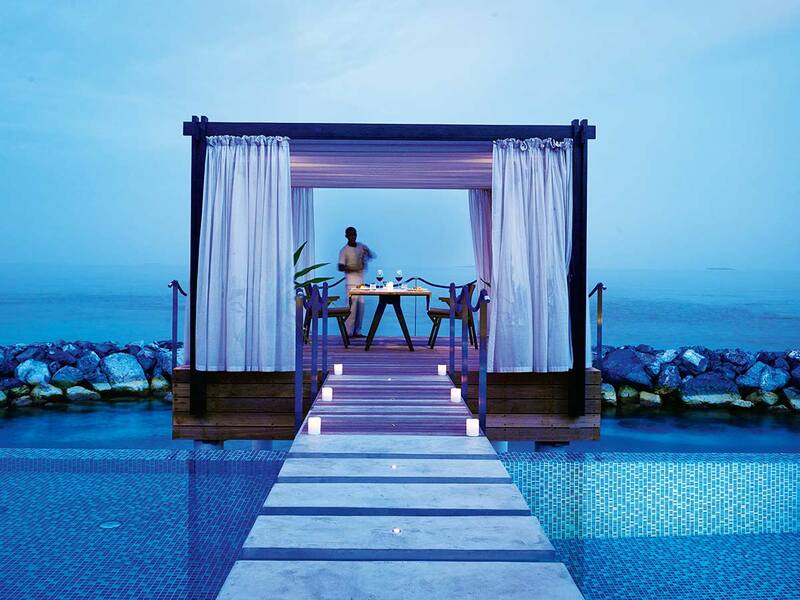 Dine under the stars over water with Indian Ocean as the backdrop. 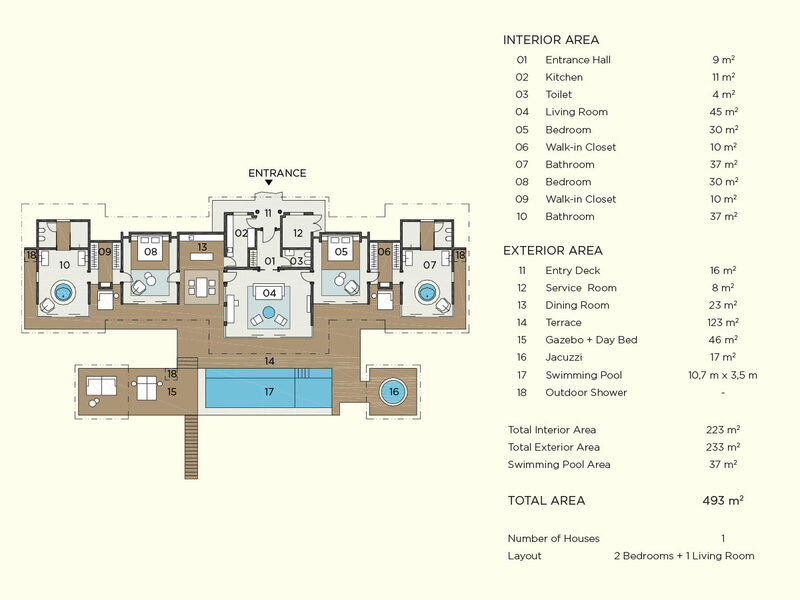 Total area extends to 501 square meters of which 223 goes to interior, 233 for exterior and 45 square meters to the pool. 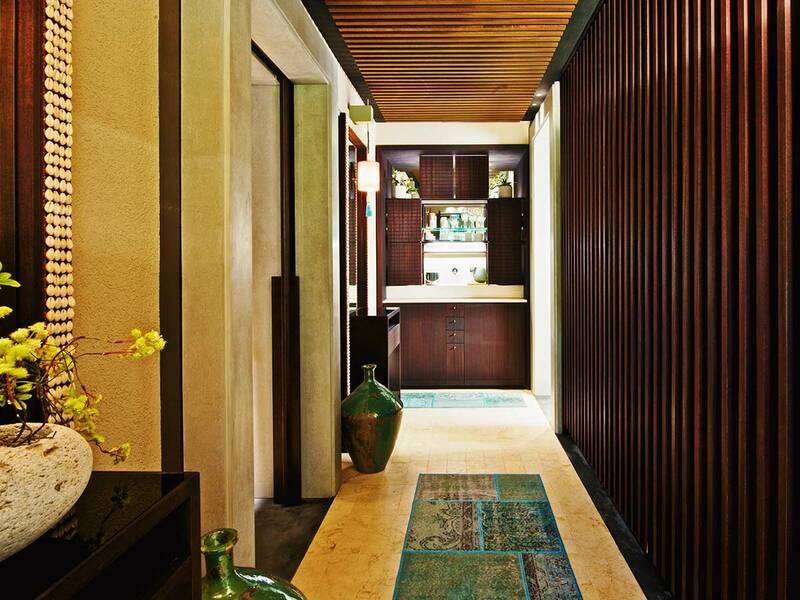 At the entrance is a living area leading to the terrace, one side is bedroom and bathroom on the other. 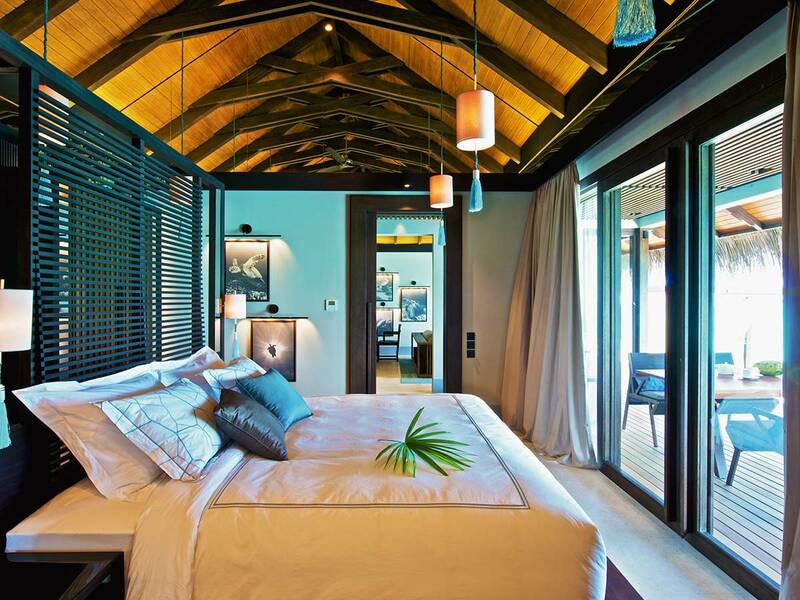 These tastefully appointed villas give unobstructed view of sunrise from bed, bathroom, living area, terrace and pool. 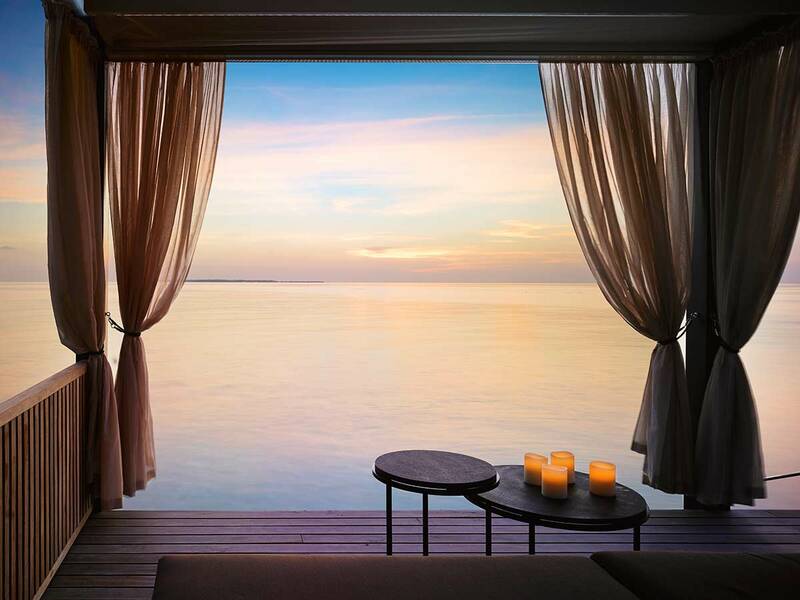 Designed to never miss a sunrise, colors and shades get reflected over the endless ocean as sun rises up over the horizon. 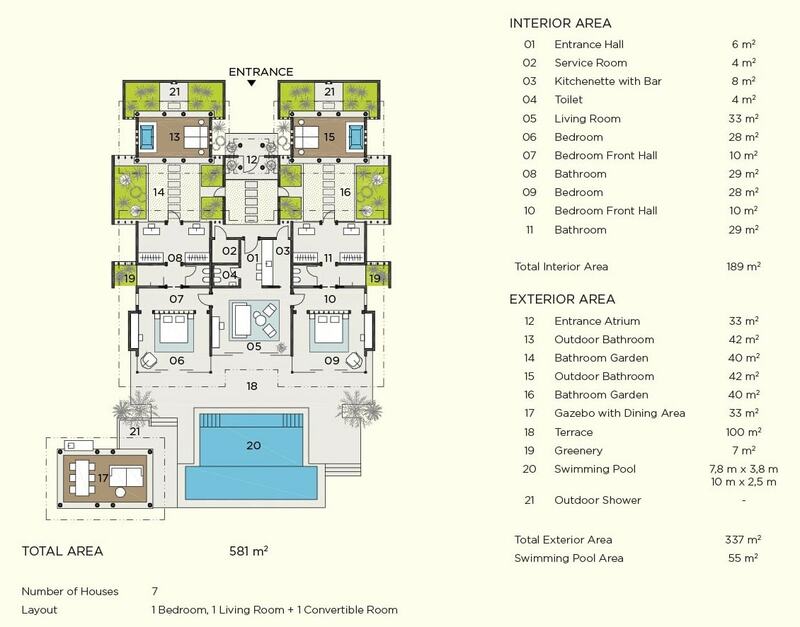 Total area extends to 232 square meters of which 94 goes to interior and 105 to exterior and 33 square meters to the pool. 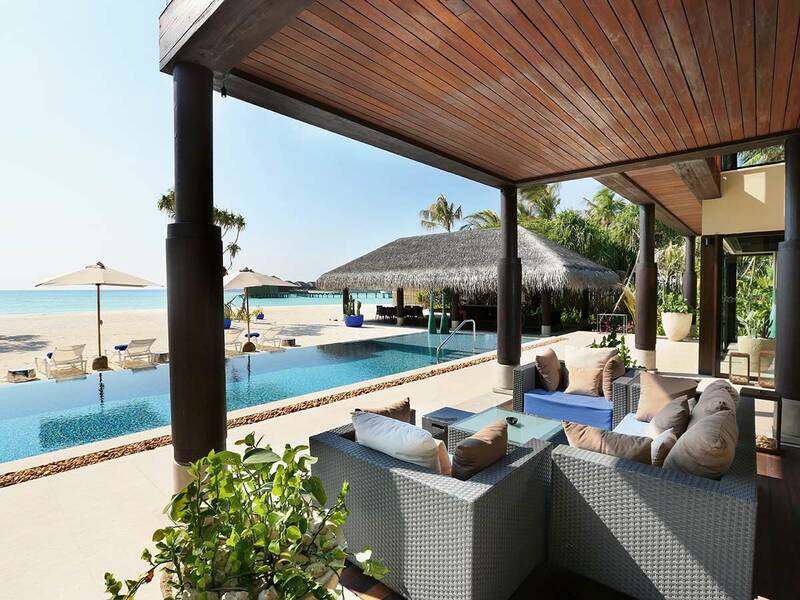 Separated by wooden pillars, each is designed for private moments and these villas come with an additional element, an unobstructed sunset view from the privacy the terrace and pool or the large day bed. 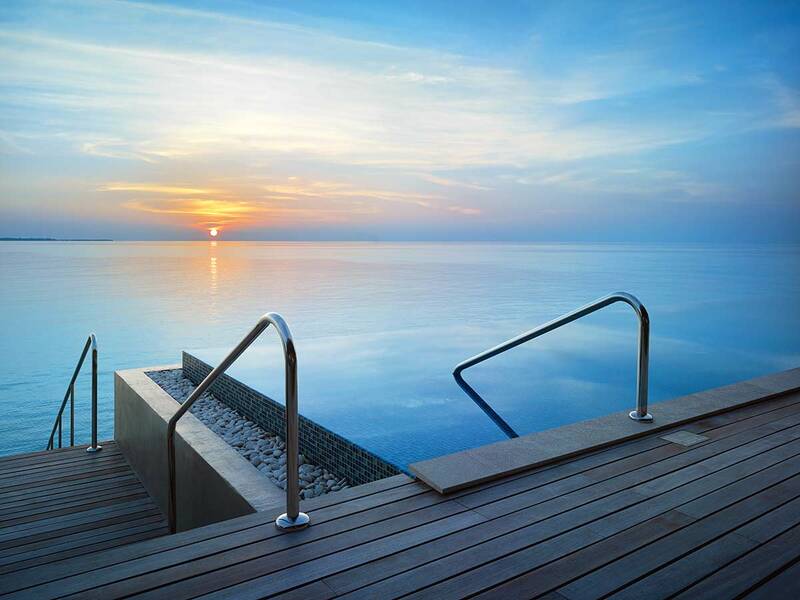 Bright sun gets yellowish fading into orange and say good-bye for the day over the horizon. 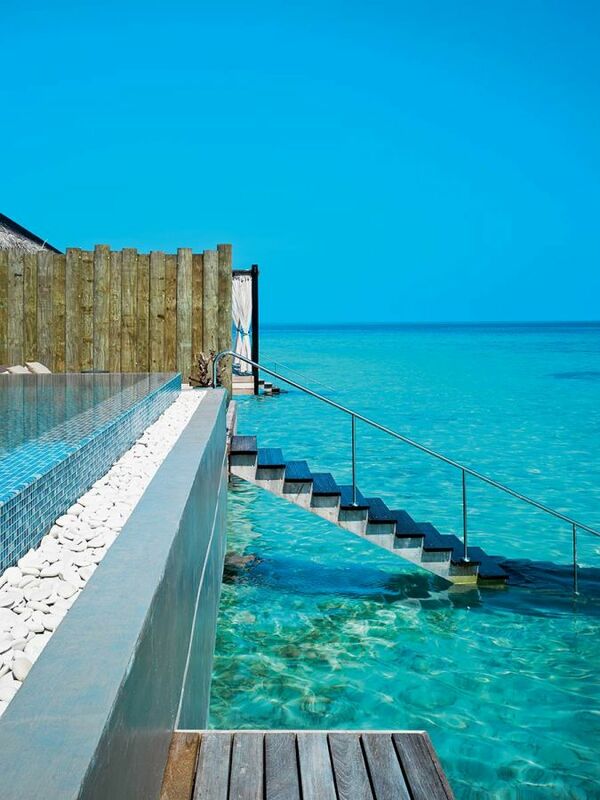 Everyday marks ab unforgettable moment in paradise. 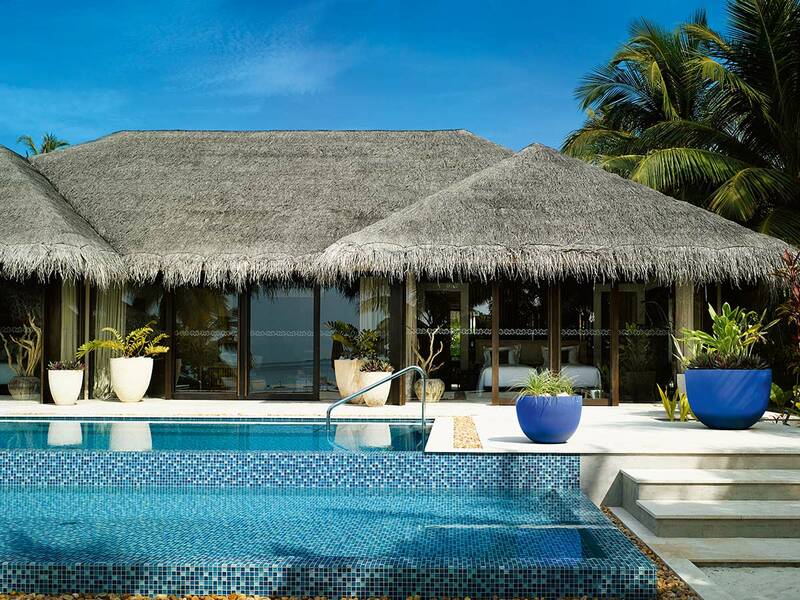 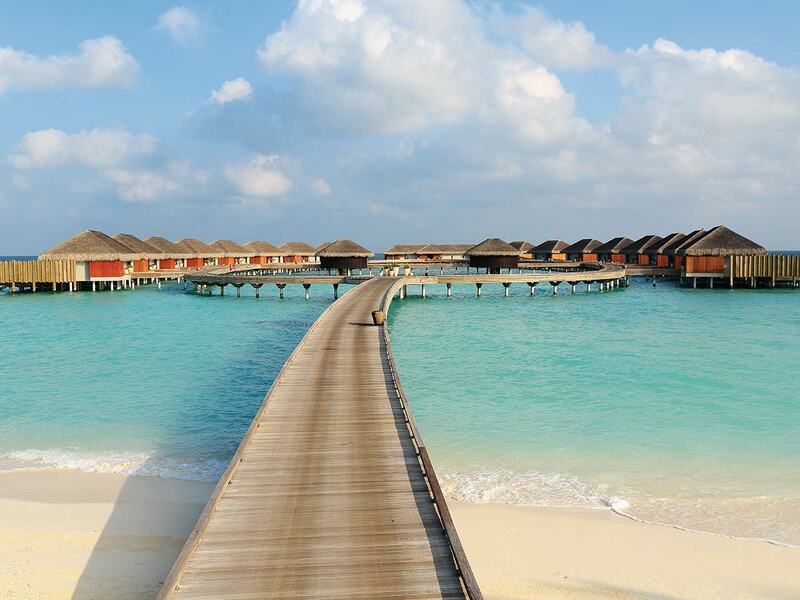 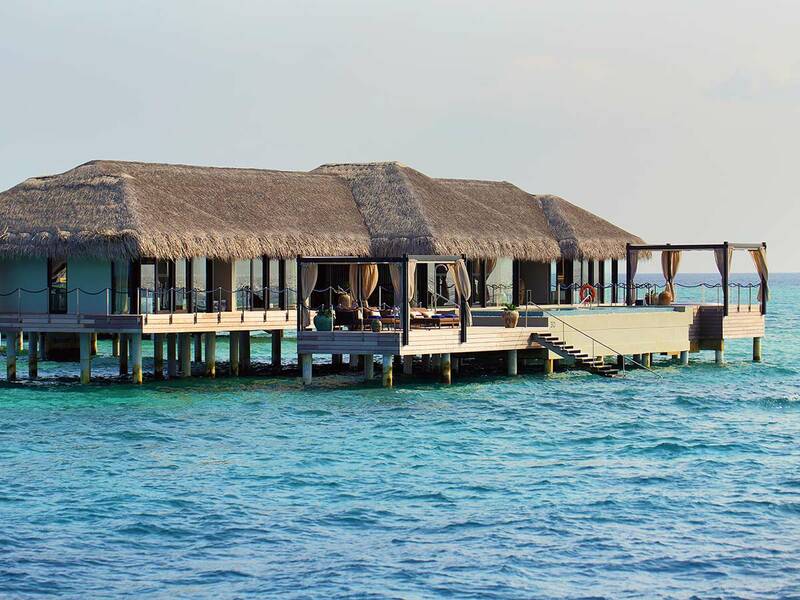 These villas are relatively bigger than Sunrise Water Pool Villa. 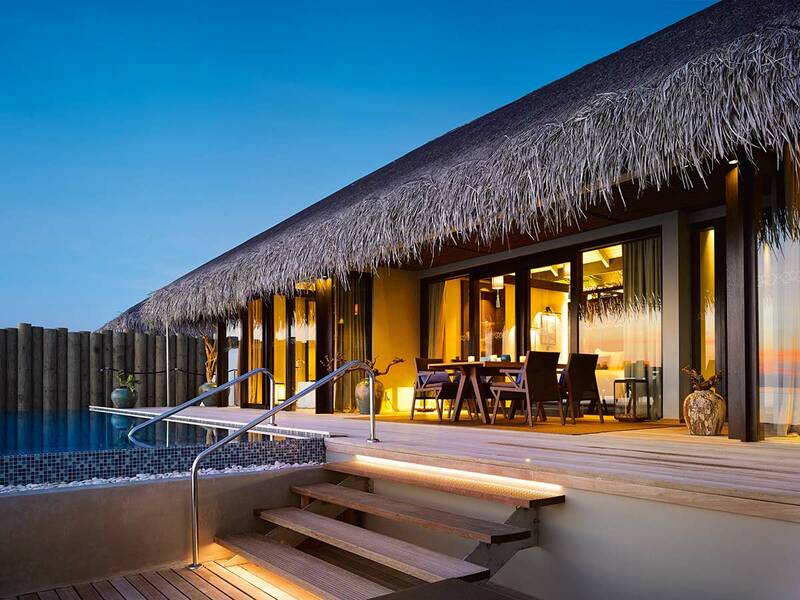 Total area extends to 256 square meters of which 102 goes to interior and 114 to exterior and 40 square meters to the pool. 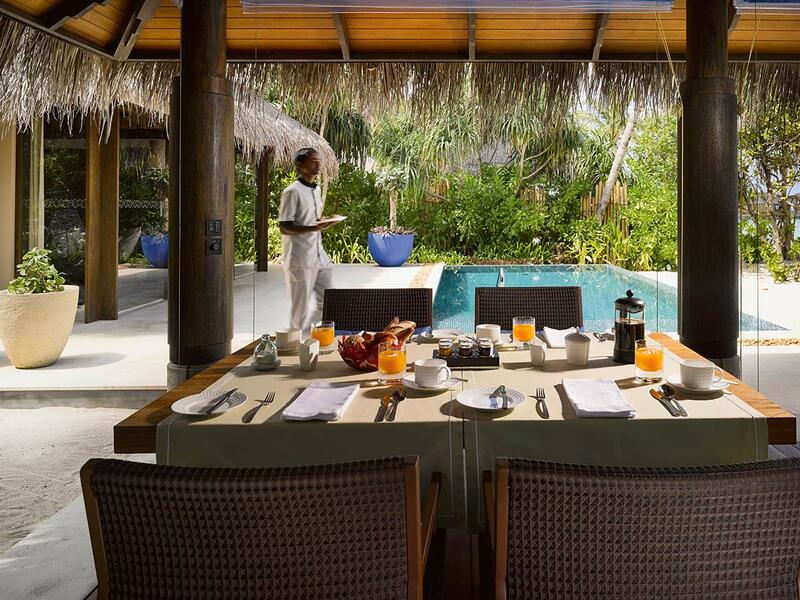 Carefully positioned in the lush vegetation, the four bedroom villas come with a large pool facing the beach, overlooking the lagoon that fades into the Indian Ocean. 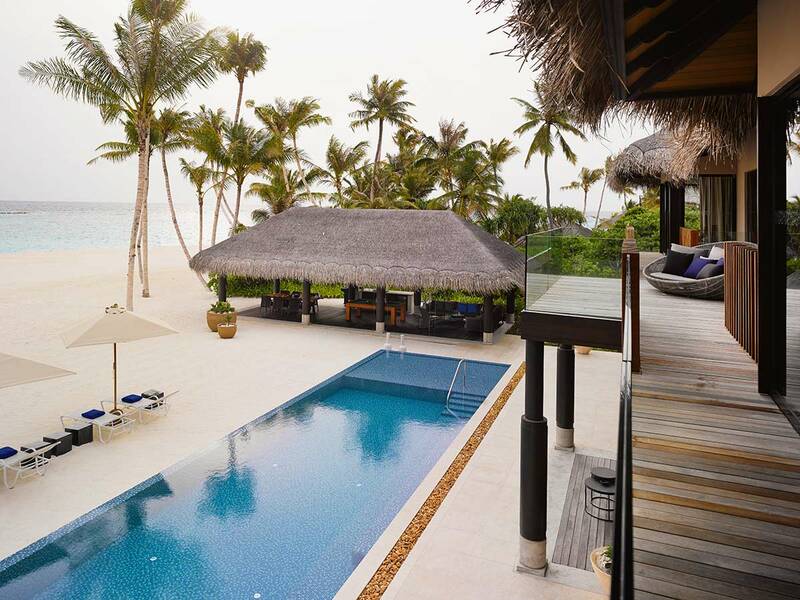 Secluded on a pristine beach, its a 1349 square meters of grand interior and exterior space, with terraces, pool and courtyward. 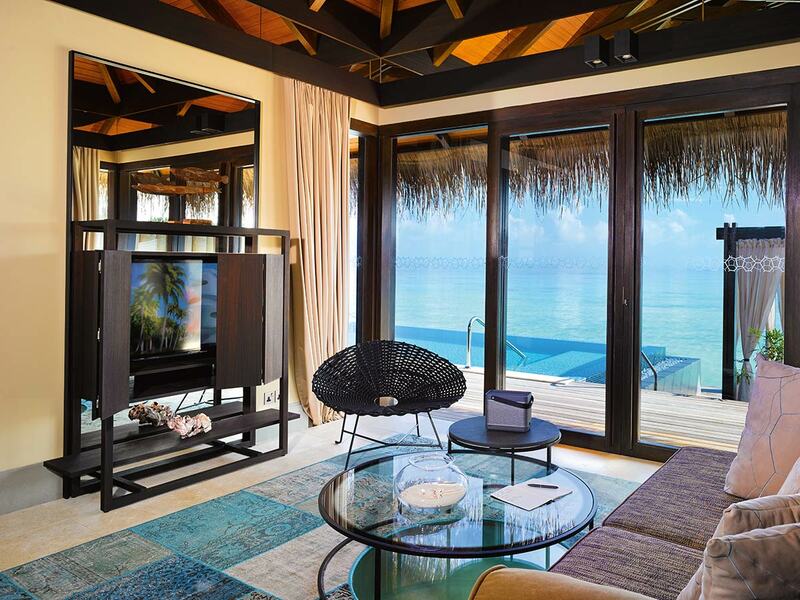 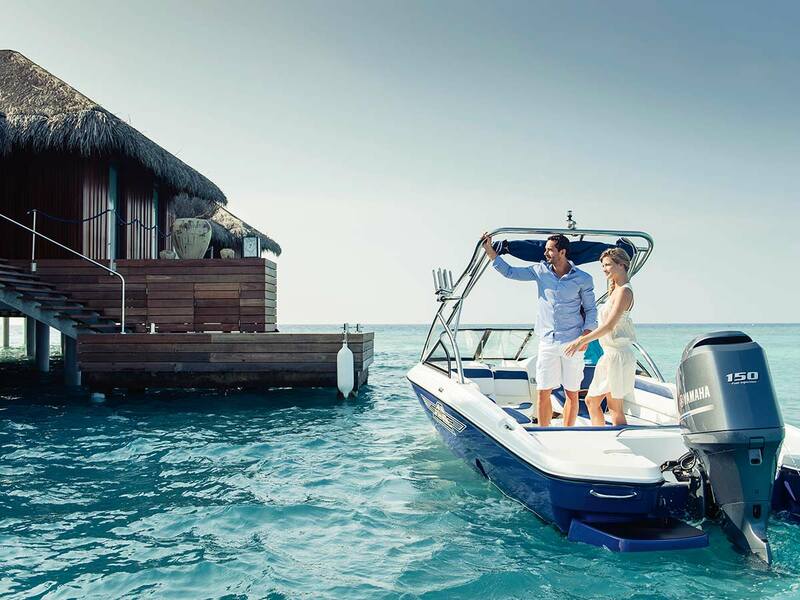 Velaa Private Residences are ideal for groups and families. 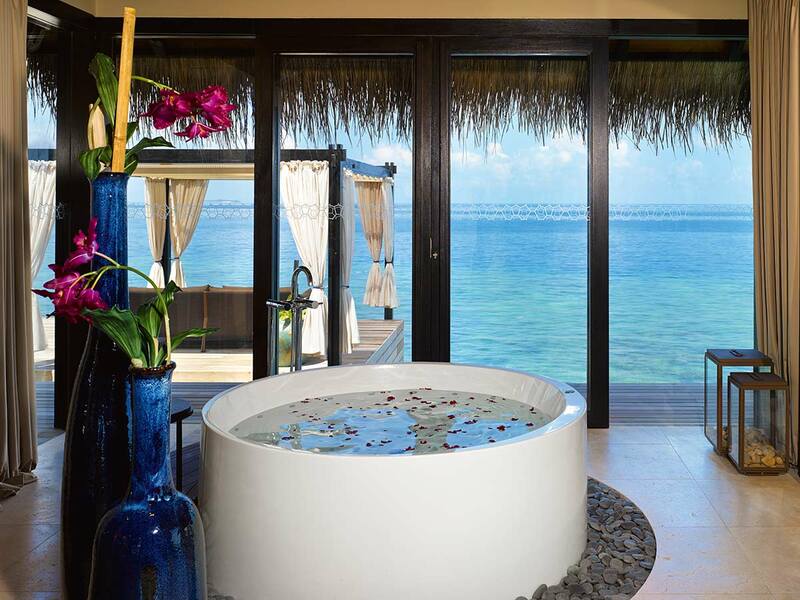 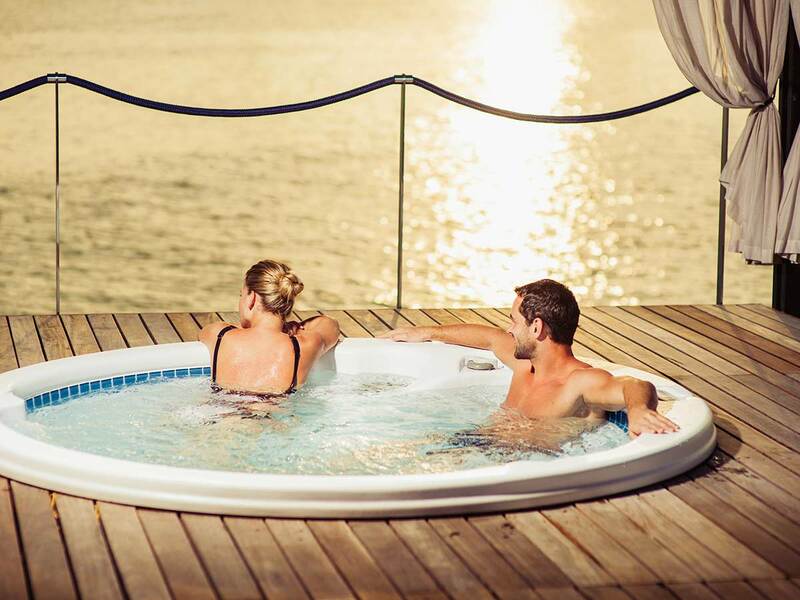 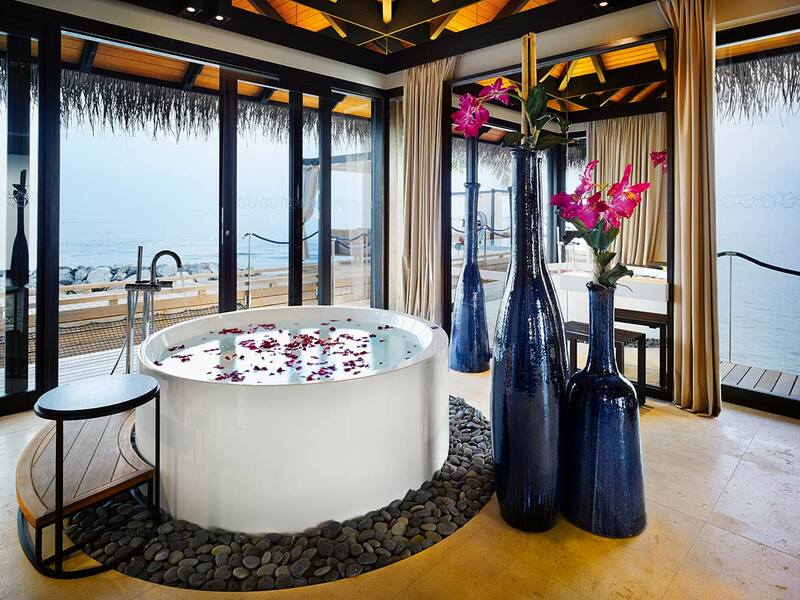 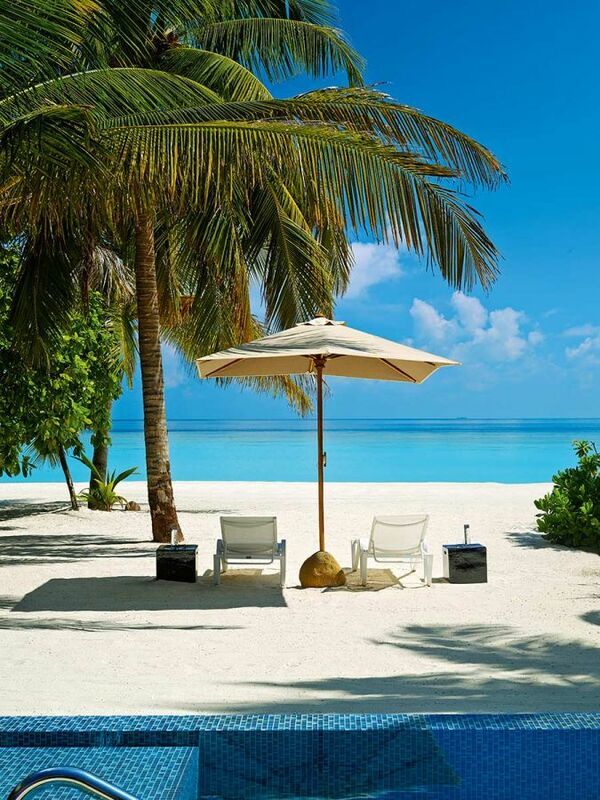 This is an atmosphere of ultimate romance in the Indian Ocean. 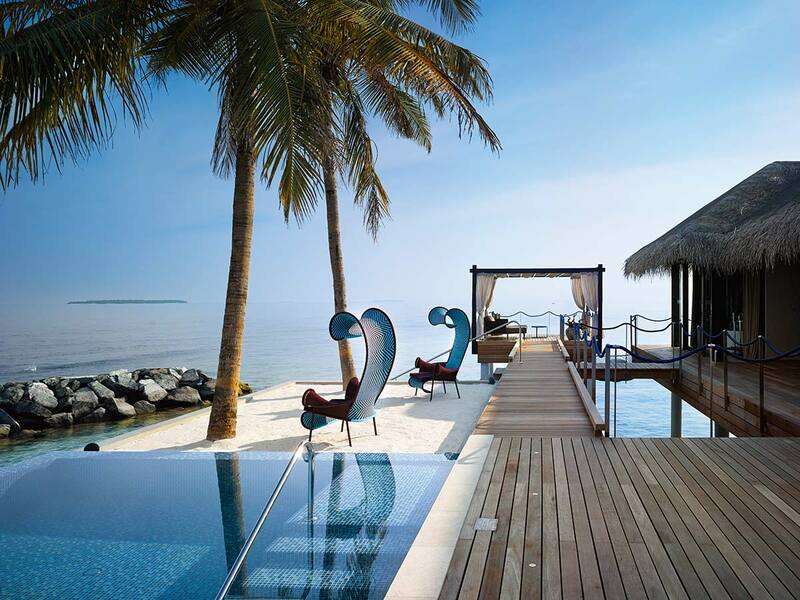 Made for a couple, two palm trees stand erect in a suspended platform over the water. 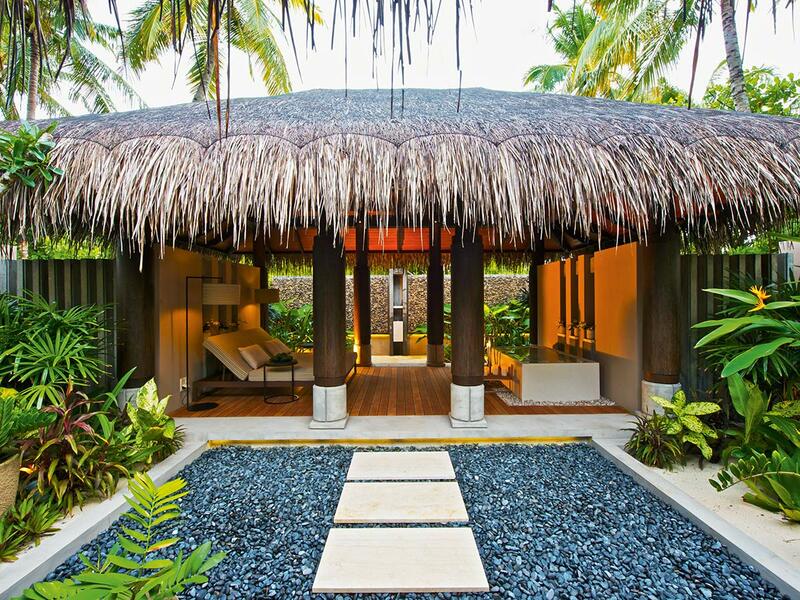 Underneath swaying palm leaves is a sized-for-two beach on the platform. 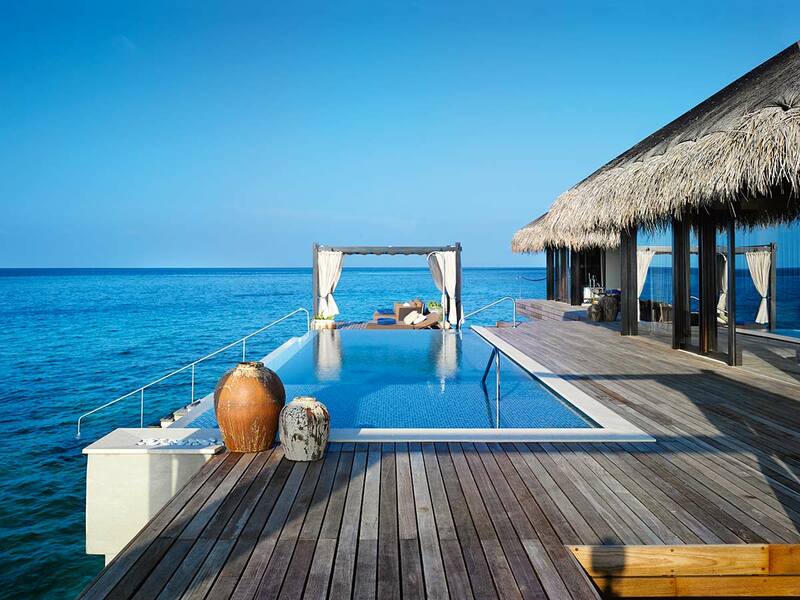 Romantic Pool Residence is totally disconnected from the island, for the utmost privacy, and can only be access by boat. 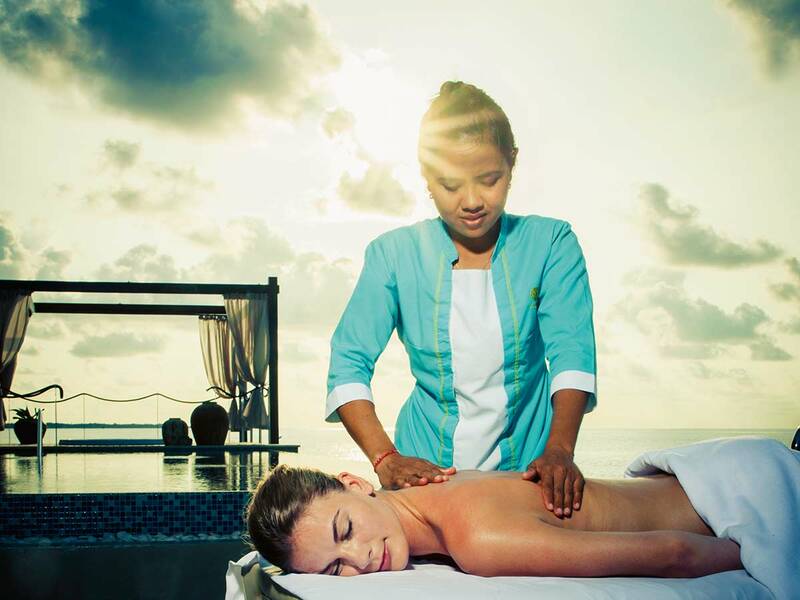 Having equipped with many facilities such as dining, private gym, spa treatments etc. 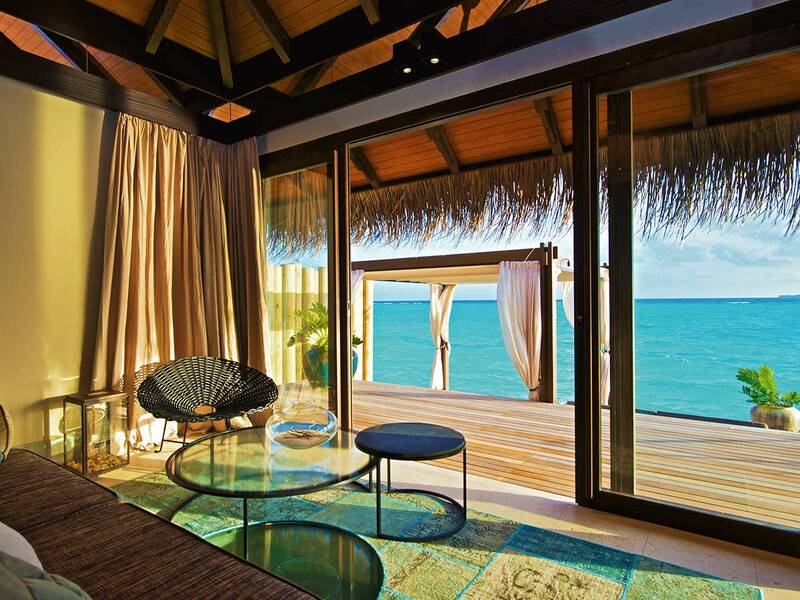 within the room there is little reason to leave. 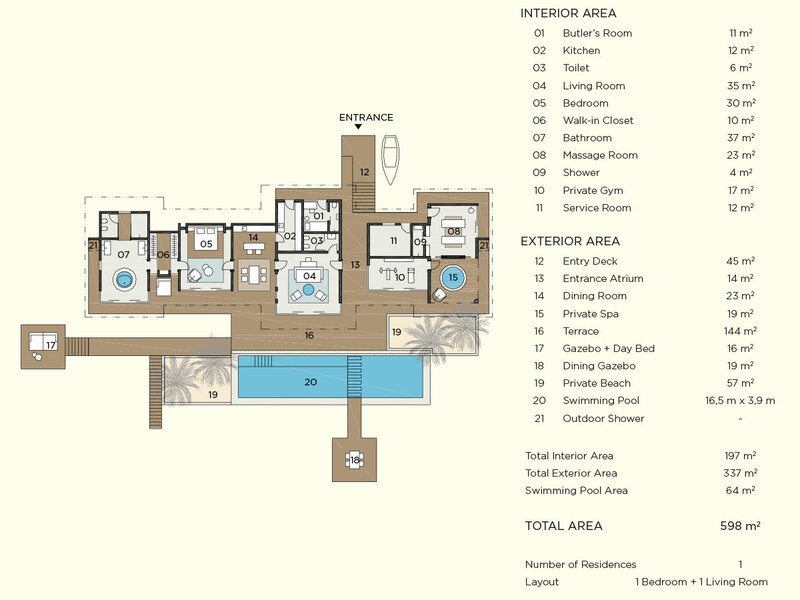 Total area extends to 623 square meters of which 197 goes to interior and 337 to exterior and 89 square meters to pool.